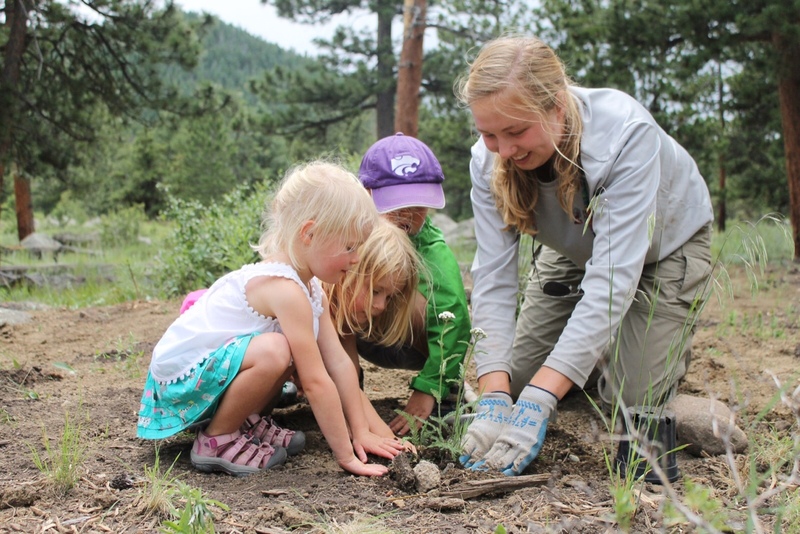 Last week, the Estes Crew unanimously decided that this summer has flown by. It’s been an amazing season already and this past week of hiking, camping, working, and cooking group dinners has brought our crew even closer. Now, we realize that it’s time to make the best of this internship and the time we have left as Estes Crew. With only two weeks of work left, we are left to reflect on the amazing experiences we’ve already had and figuring out exactly how we’re going to fit in all the other hiking goals, fishing experiences, and traveling before the season’s end. 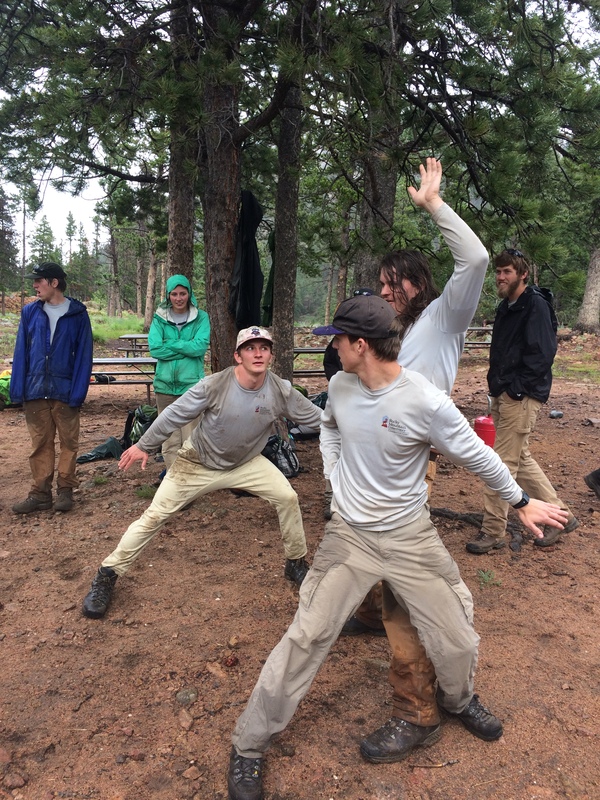 The 6th week of work for the Estes Crew was kicked off by a backpacking trip that was adventurous to say the least, then followed by a week that presented new and unfamiliar projects with the trails crew. 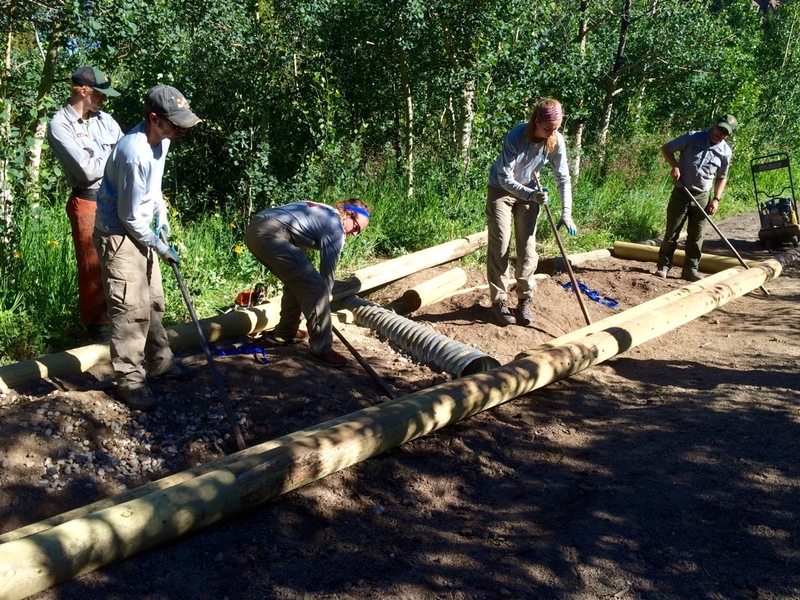 We were challenged with making group decisions in the wilderness and then gain when we had to tackle building a culvert at Lily Lake for work. 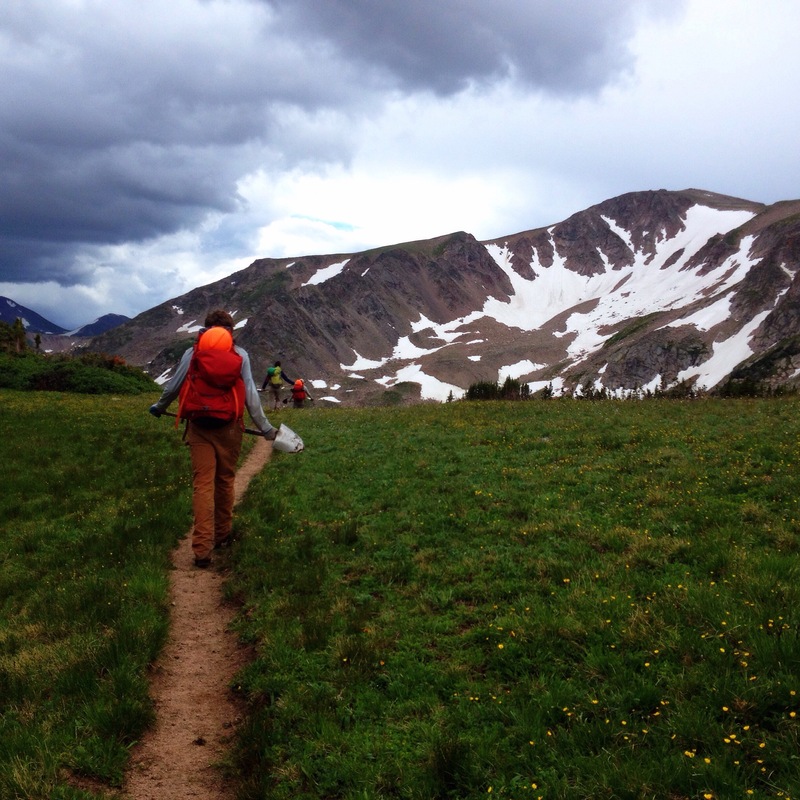 The rainy and difficult backpacking trip to Mt. 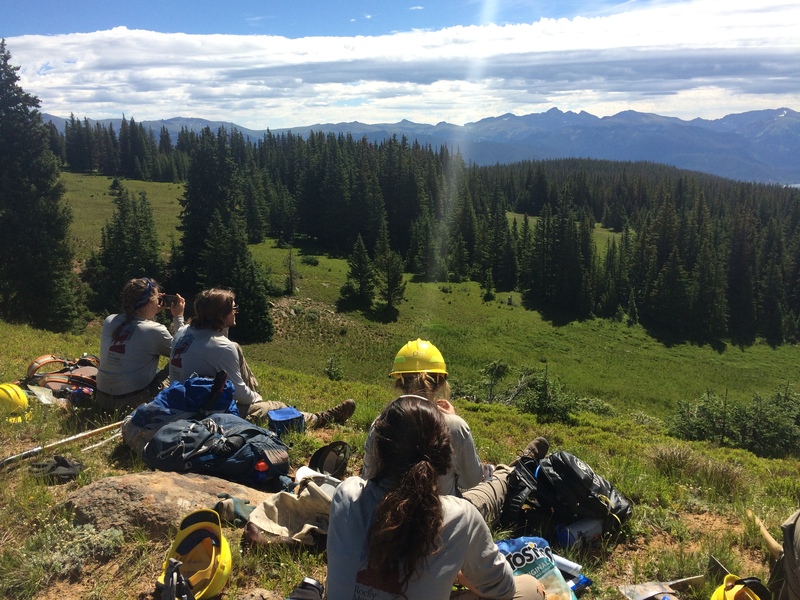 Ida and Upper Forest Canyon could have potentially left our crew with low morale, but instead we worked on making decisions as a group. And feeding off of each other’s positive energy. 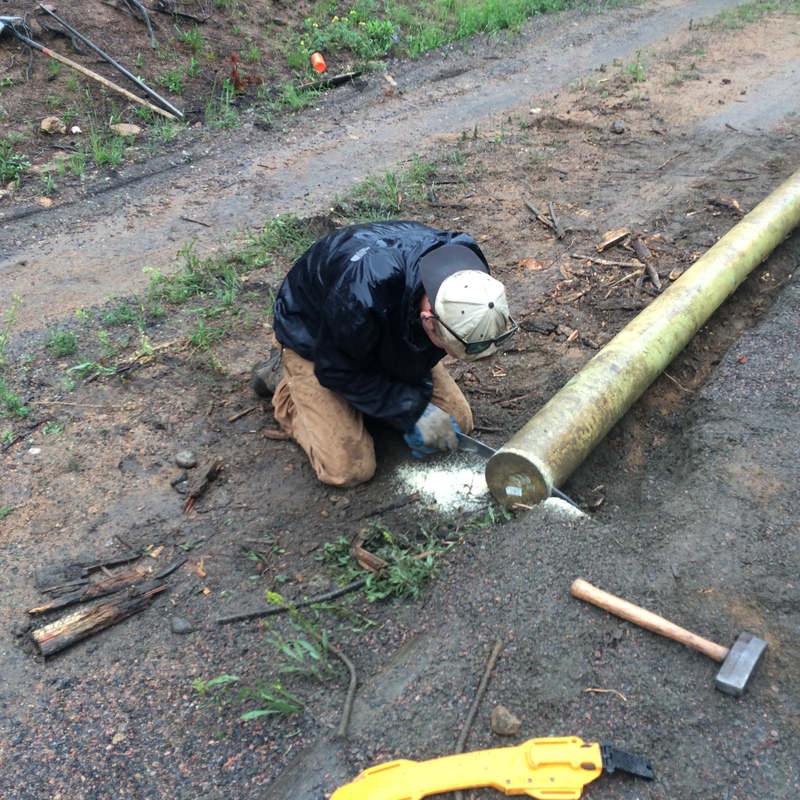 Since we were able to strengthen our crew through the trip, we were able to take on the Lily Lake culvert, which was a type of project we were all unfamiliar with. All in all, I’m so proud of how Estes Crew performed this week and I can’t wait to see how our next week goes when we’ll be back working with Natural Resources. 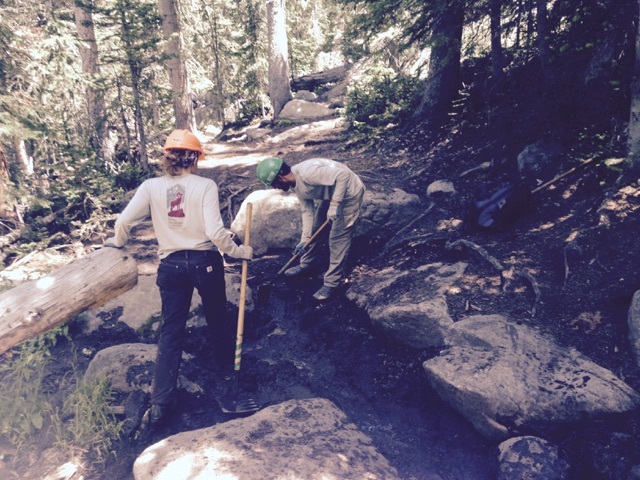 Andrea, Chandler, and Matthew from NPS working on providing material to retread the trail. 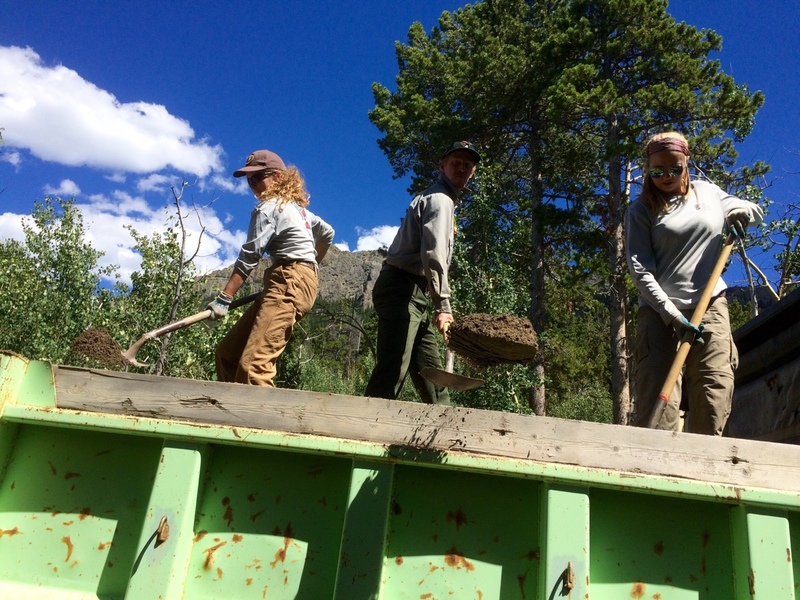 Last week The Red Feather Crew was once again back in the Estes Park area working with the Forest Service on the North Fork Trail that was effected by the 2013 floods. This time we working on finishing the end of the re-route we were working on before mid week. 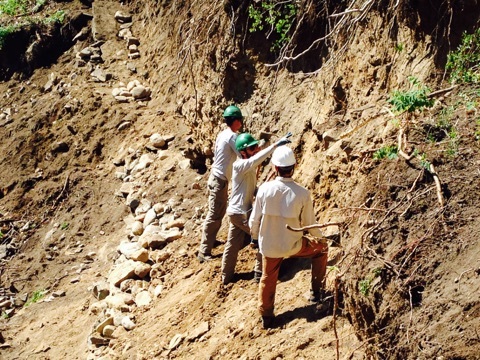 This entailed days of building rock walls to provide stability for the trail and to try and prevent another washout from completely taking out the trail again. 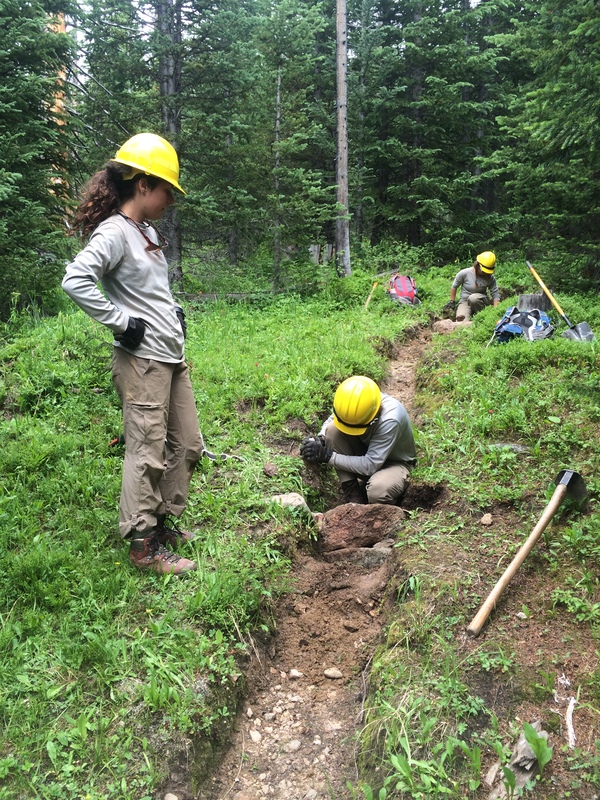 As a crew we built 40 feet of trail that included putting in the rock walls and moving a lot of dirt to make the trail ready to be hiked on. 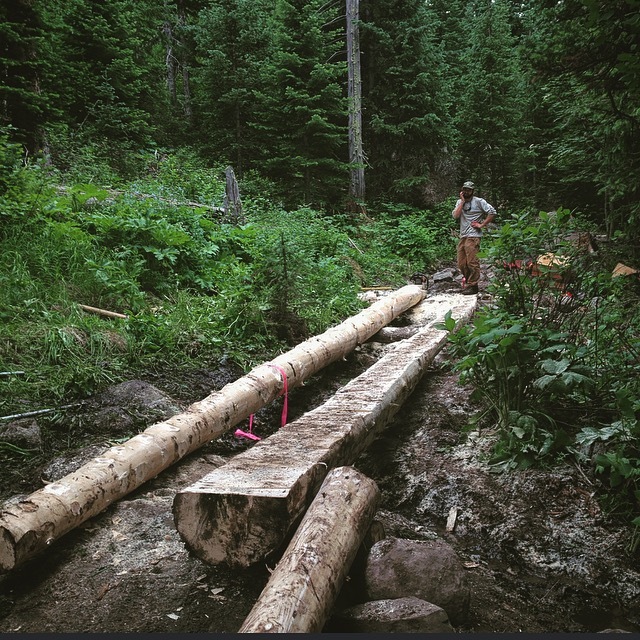 Another project that we got to work on early in the week was building a whole new section of trail that turned out to be around 35 yard of new tread. 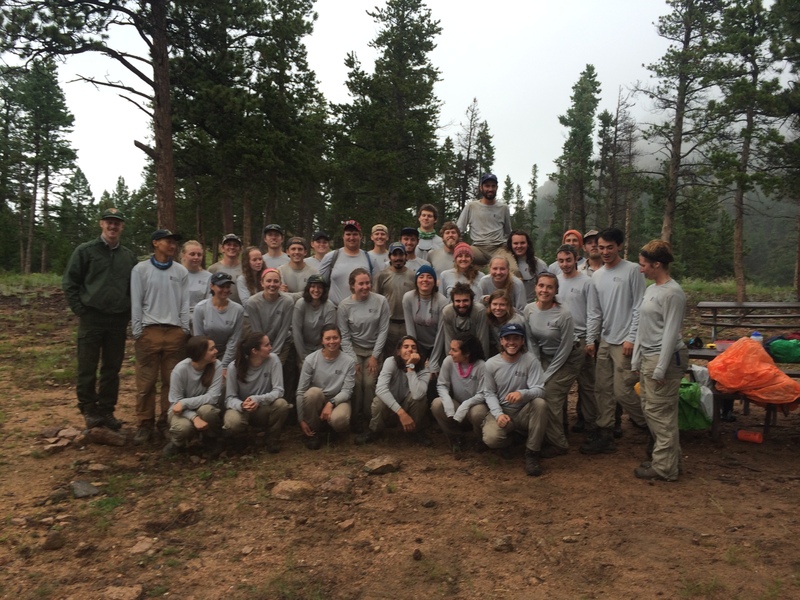 This was a fun experience for everyone because we were able to work on seeing a tangible difference in the trail and it only took a half a day. 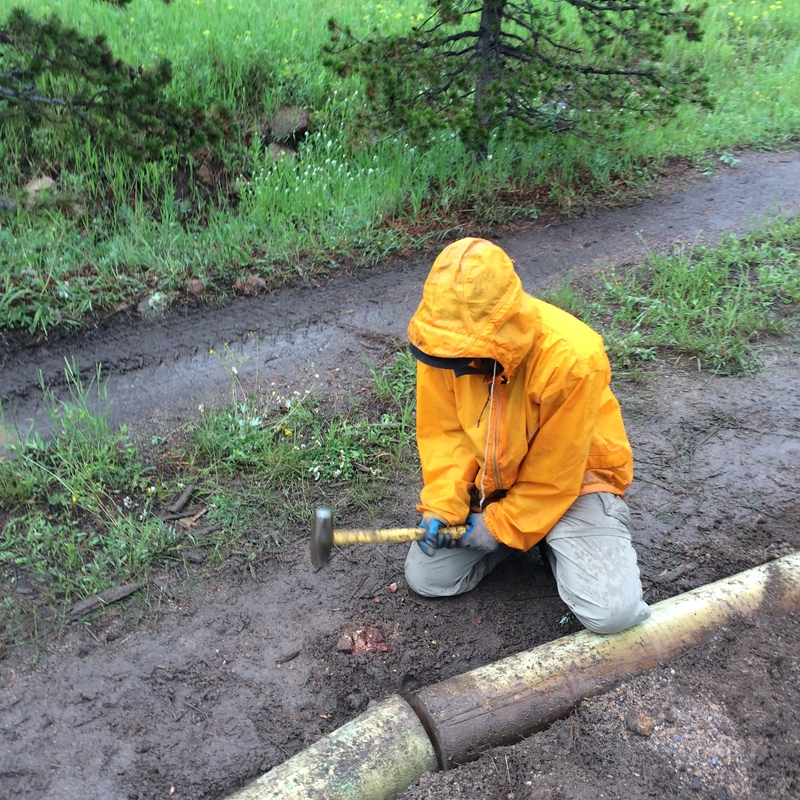 This entailed lots of sledge hammering rocks and moving a lot of dirt. 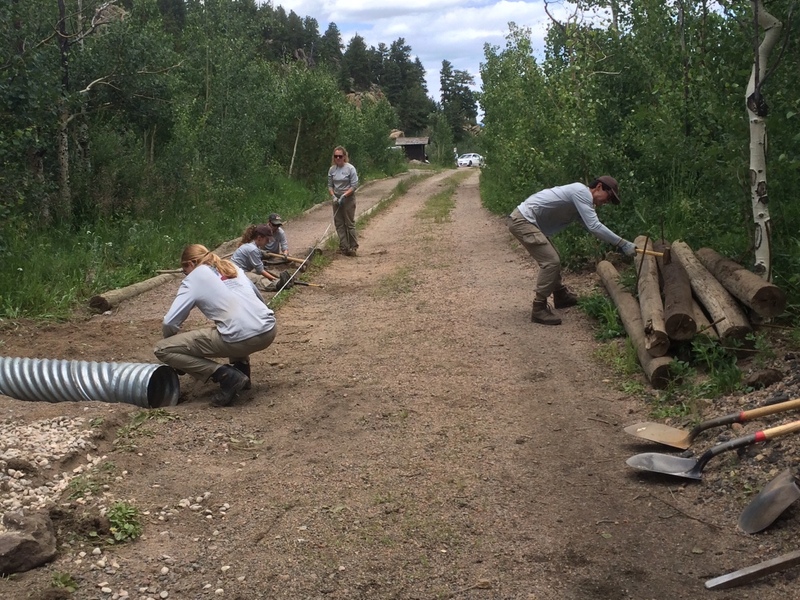 For the last couple days of work we worked from the actual trail head and worked on building more retaining walls and a gabion. A gabion is something that is usually used for retaining walls on roads, but we were building this so that the trail will not completely wash away if another flood hits the area. 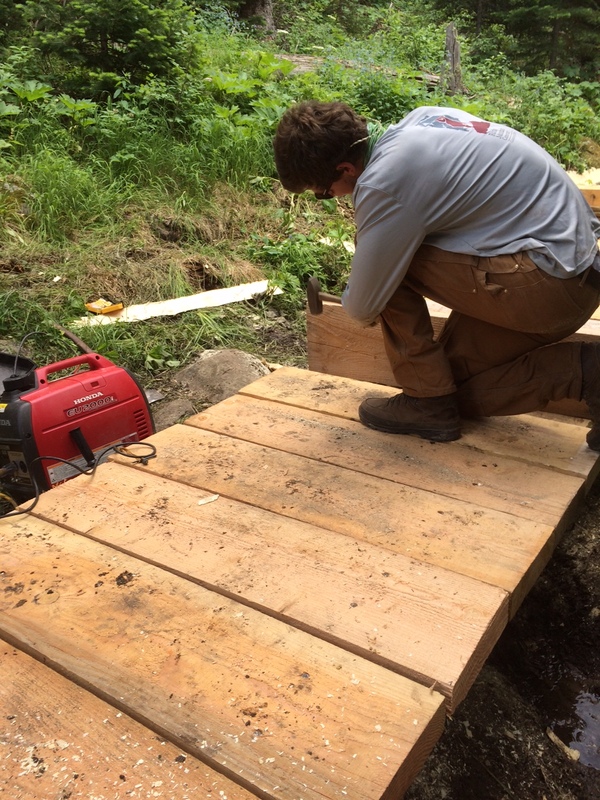 For this we needed to cut out and flatten a 25 foot section of trail and build this rock catch and throw thousands of pounds of rocks to keep the structure stable in hopes of providing stability for years to come. 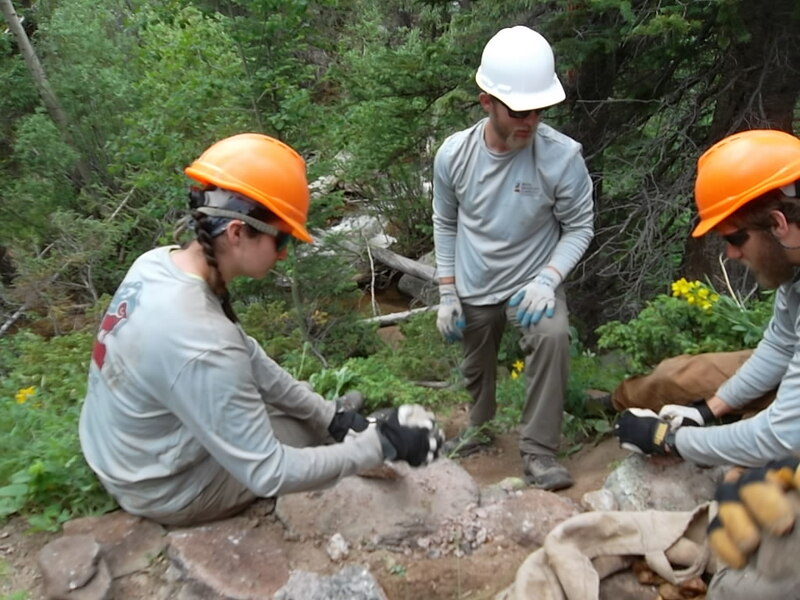 After Education Week, the crews are right back in the field, hard at work, preserving and conserving the natural resources of Northern Colorado. Check out the updates below from each crew’s week! 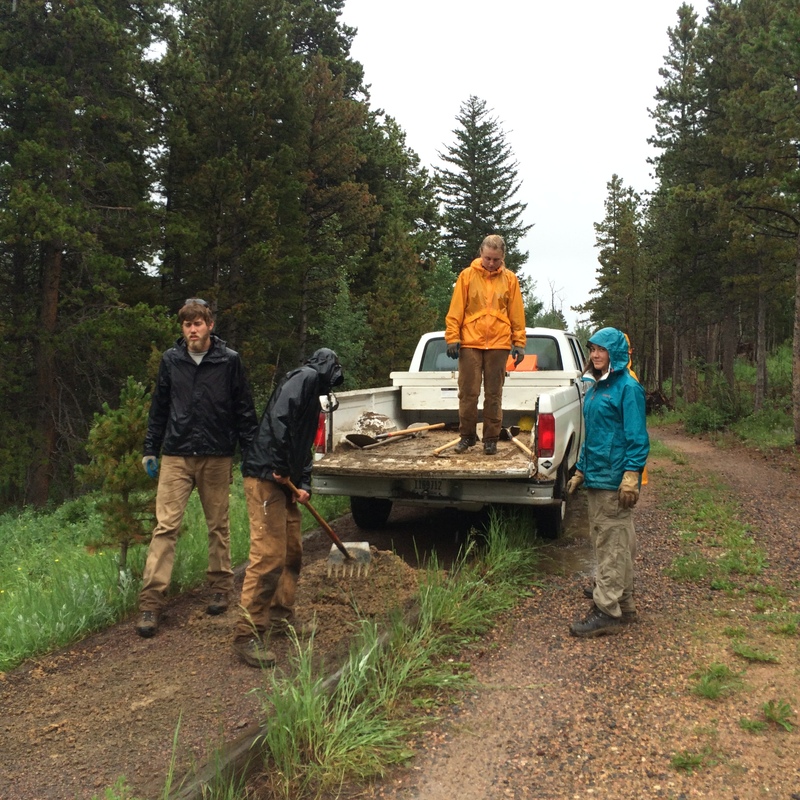 This week, the Estes Crew worked with the National Park Service revegetation crew at Tuxedo Park on Bear Lake road. After the construction of a shuttle us stop, there was a large disturbed area. On Monday, we pulled all of the cheat grass and pennycress, both invasive species, from the area and laid down a layer of good soil. 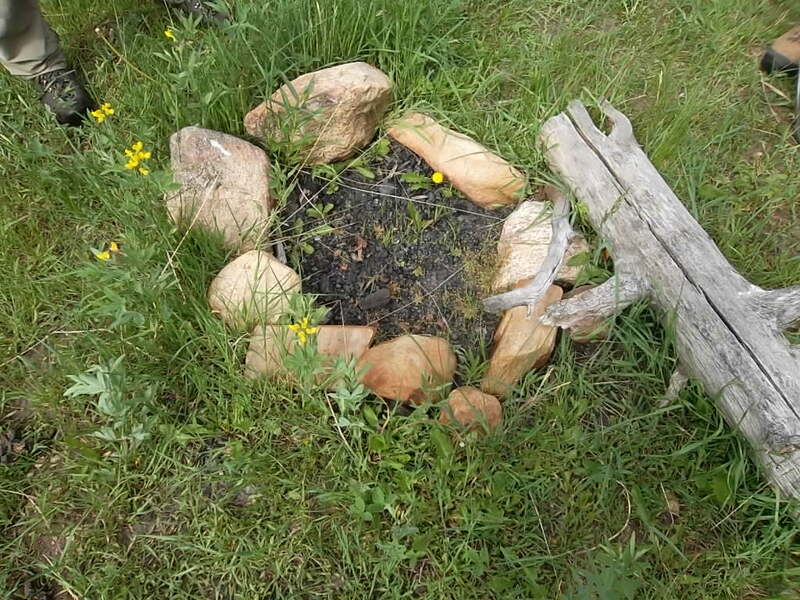 We then planted plants such as rose bushes, shrubby cinqfoils, yarrow and a variety of native grasses. 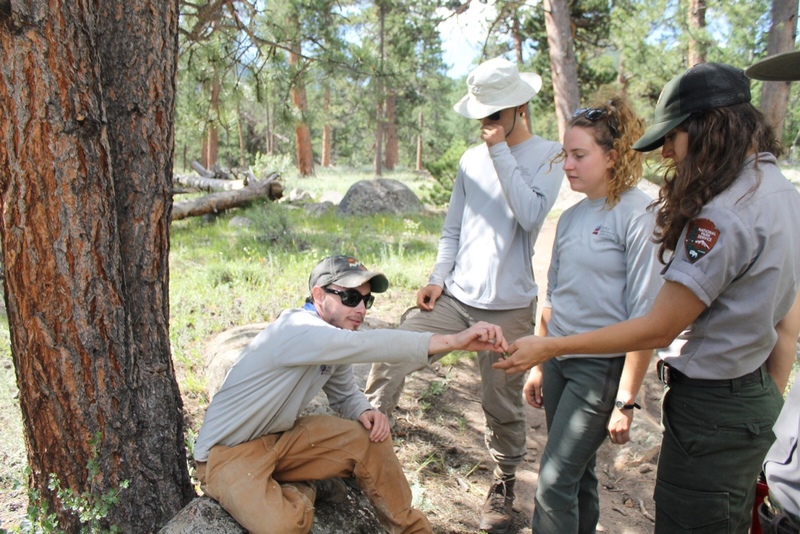 On Tuesday, we worked with a group of volunteers from Costa Rica, who were here because Rocky Mountain National Park and Sana Elana Cloud Forest, where they are from, share many migratory bird species. It was interesting to learn about their culture and how our ecosystems in our respective parts of the world share many similarities and differences. On Thursday, Geoff came to help us plant for half the day, then attended a Round Table discussion for the Natural Resources division with us. The discussion was about shifting paradigms and seeing things from a different perspective. 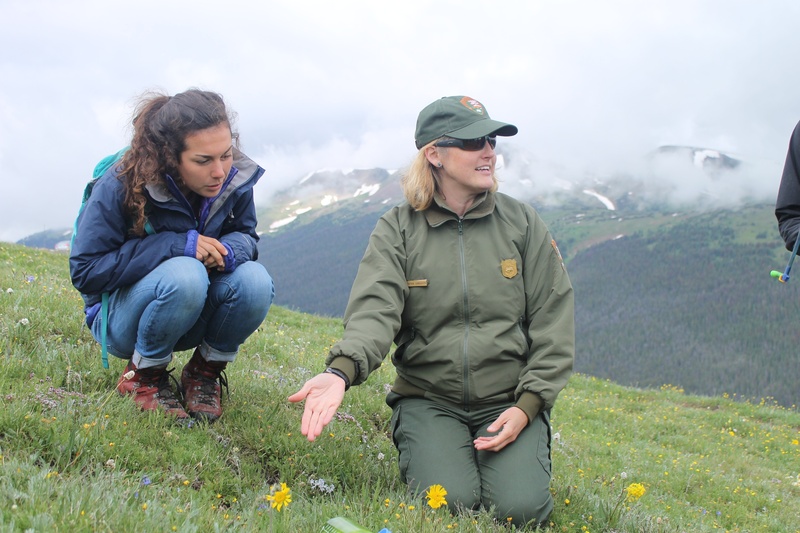 It was interesting to see the viewpoints on career advancement and conservation from a variety of people with a wide range of experience working in Rocky Mountain National Park. 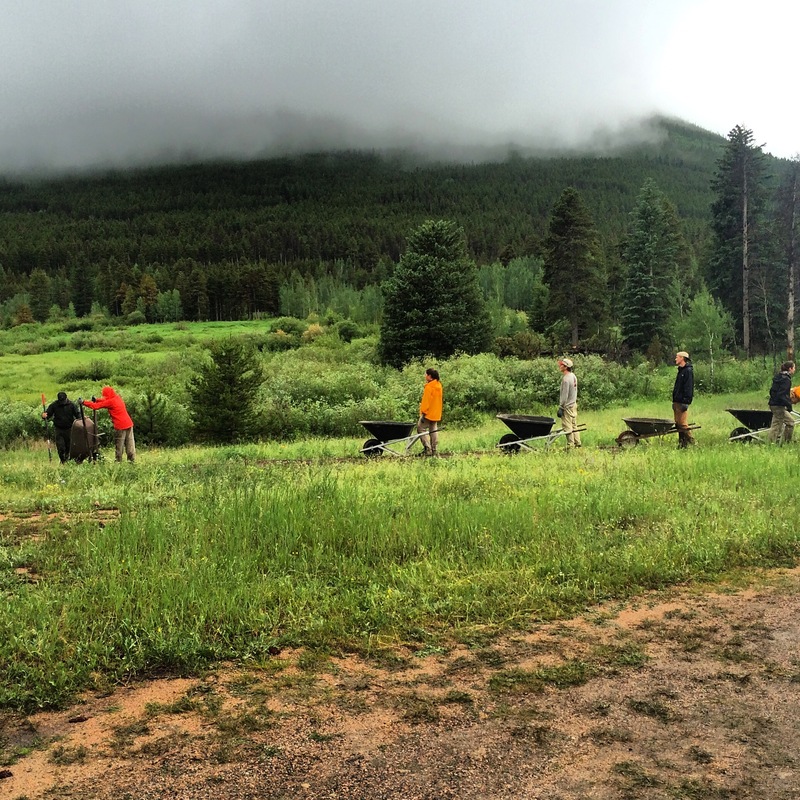 Overall, it was a fantastic week and we aided in planting 4,668 plants at Tuxedo Park. 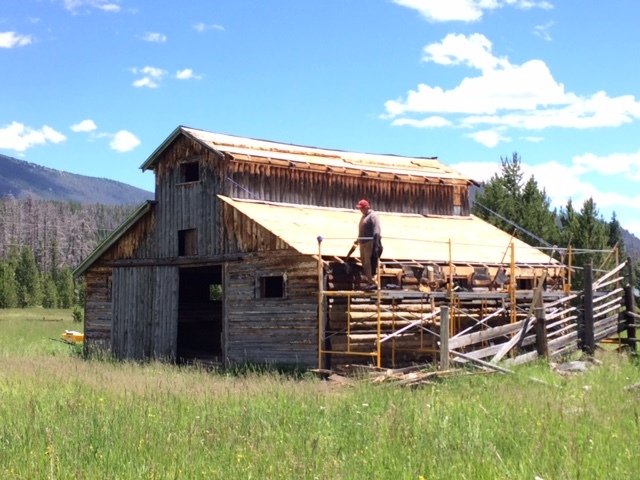 It was a busy week for the Kawuneeche Crew, we finished the roof of the mess hall at lake Irene, and moved on down the valley to the Little Buckaroo Barn. 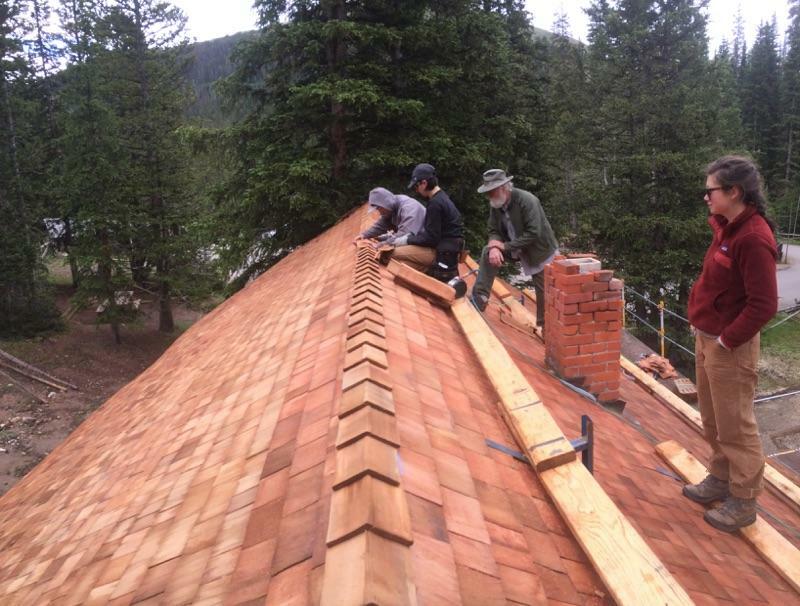 There is a lot to do there, but we’re starting with laying out tar paper and plywood on the roof, which is installed before placing the asphalt shingles. We also replaced some of the rotten siding boards with new ones and reset the original siding boards we had removed when repairing the rafter tails earlier. 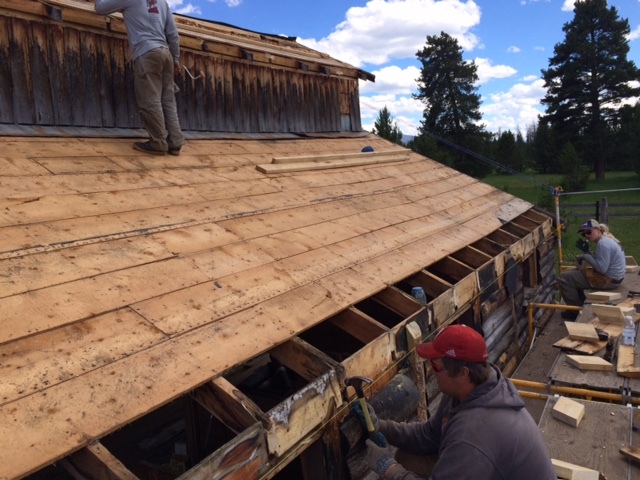 With the lower roof’s rafter tails finished, we moved to the upper roof and took off the first layer of sheeting board and upper siding to saw off the rafter tails. We then cut and measured new tails and prepared them to be drilled into the existing rafter base. 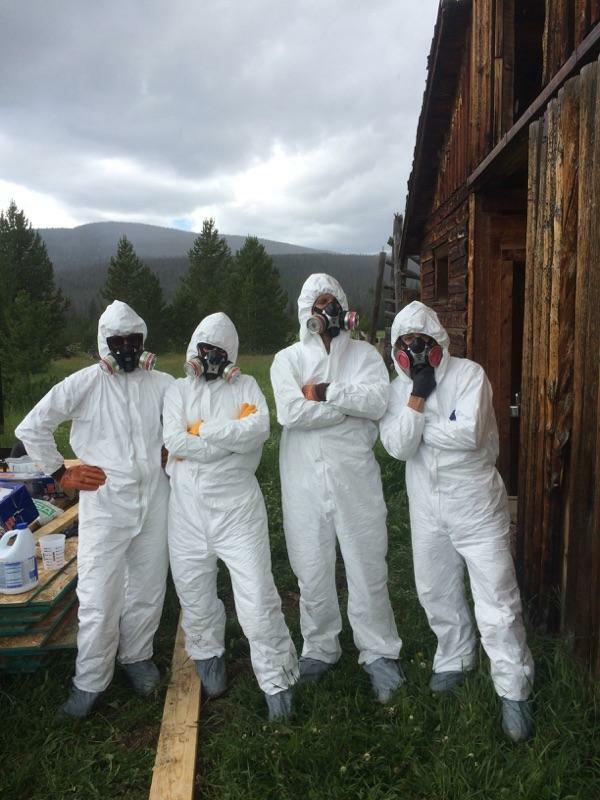 Joe, Dhante and Margaret got to start using their respirators and super suits at the barn this week as well, spraying a bleach solution over the hay loft and the ground floor to neutralize the hantavirus that could be lurking there. Overall, a few more splinters, a few more mosquito bites, and a lot more work completed this week! 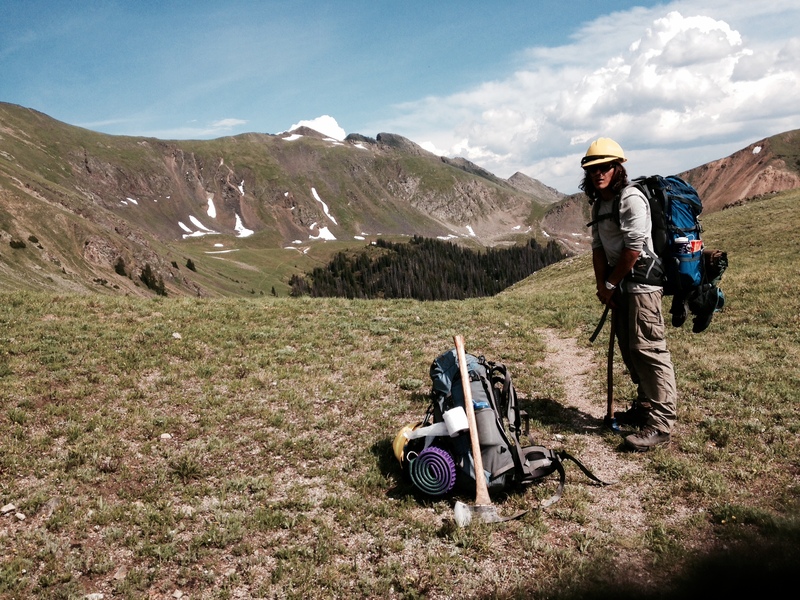 This last week of work was quite the doozy with the Red Feather Crew hiking nearly 40 miles in 4 days. Everyone thought it was a nice change of pace though as we got to stop building turnpikes and start some trail maintainance. 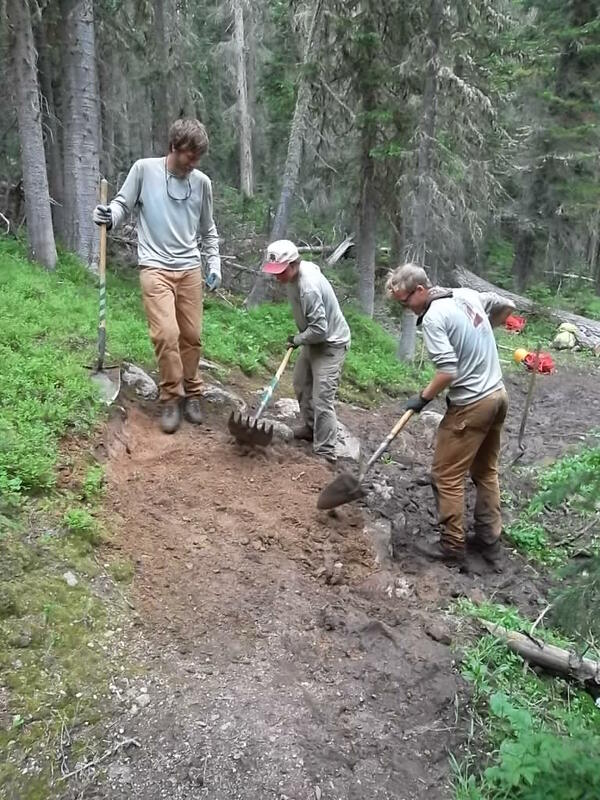 On Monday and Thesday we worked on the North Lone Pine trail doing general maintainance run while also putting in 15 new drains and a few check dams. 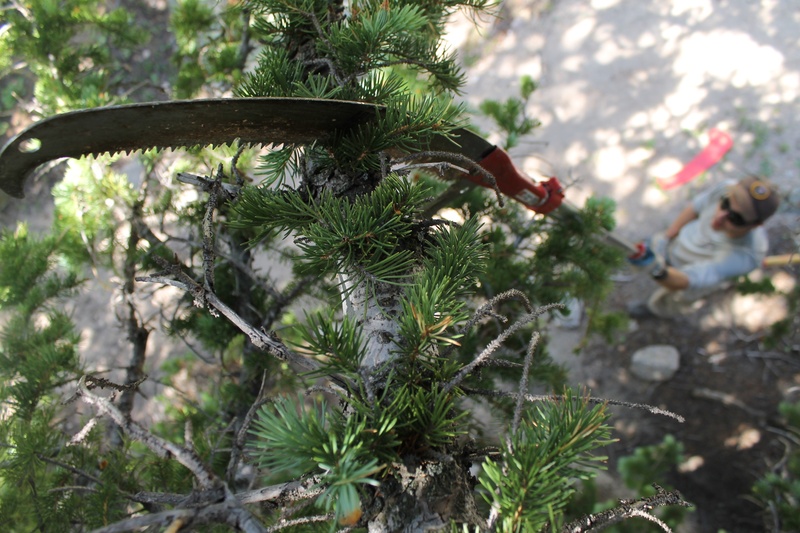 We also were able to cut some trees out of the trail cause with a single buck saw. On Wednesday we found ourselves working in the Swamp Creek trail. This is a multi use trail which saw its most action from motorcyclists. On this trail we spent the majority of our time clearing corridor as well as cutting logs that were too close to the trail and lining basically the whole thing. 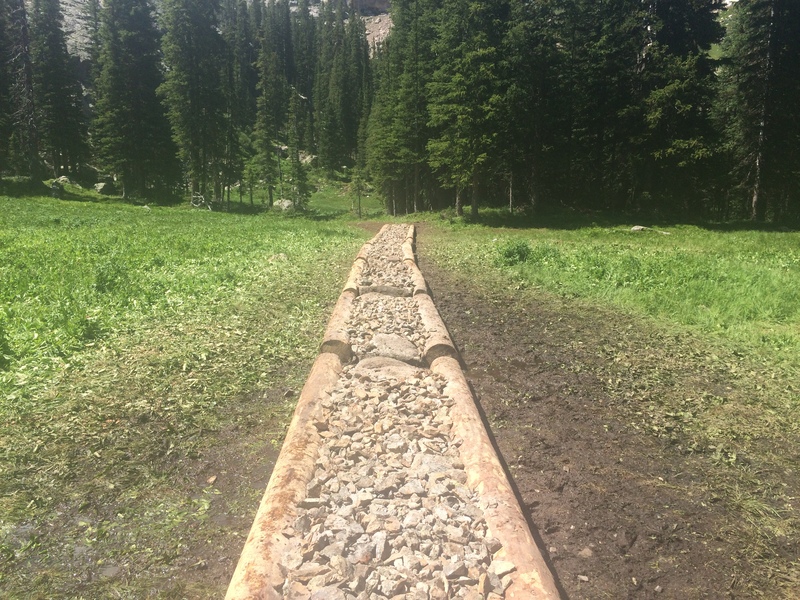 We also put in another 10 drains and did a good job of clearing out several very wet areas that are now dry and will be much easier to hike and ride in. On Thursday, we went back to Lady Moon. 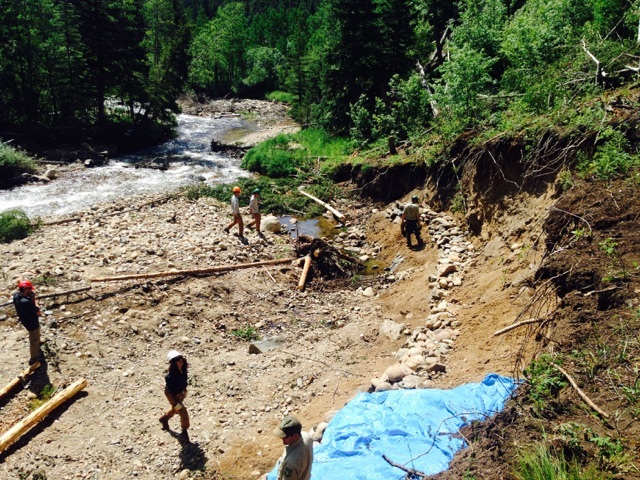 This time not to build a turnpike, but to hike the trail and do some drain clearing. 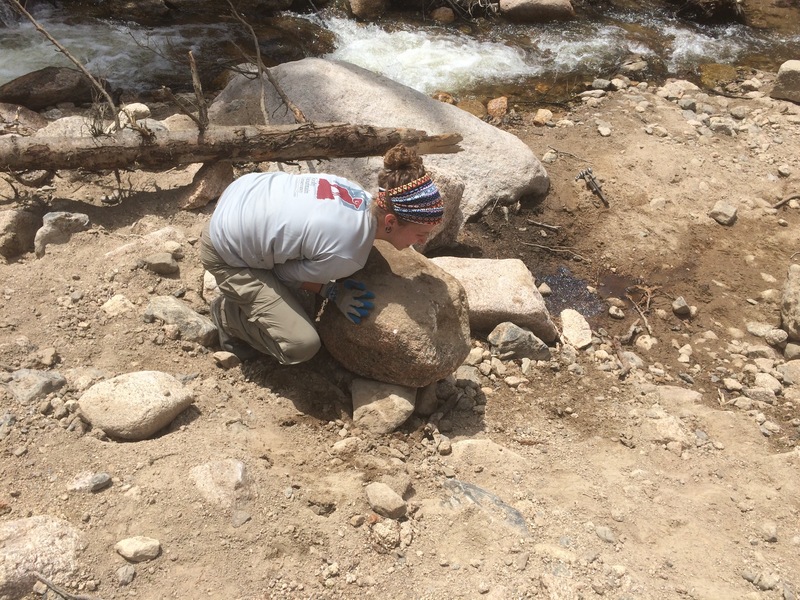 This entailed us to build a large drain system that was around 30 feet long diverting the trail, which had become basically a creek, to a meadow with the help of the long drain and an awesome rock bar. 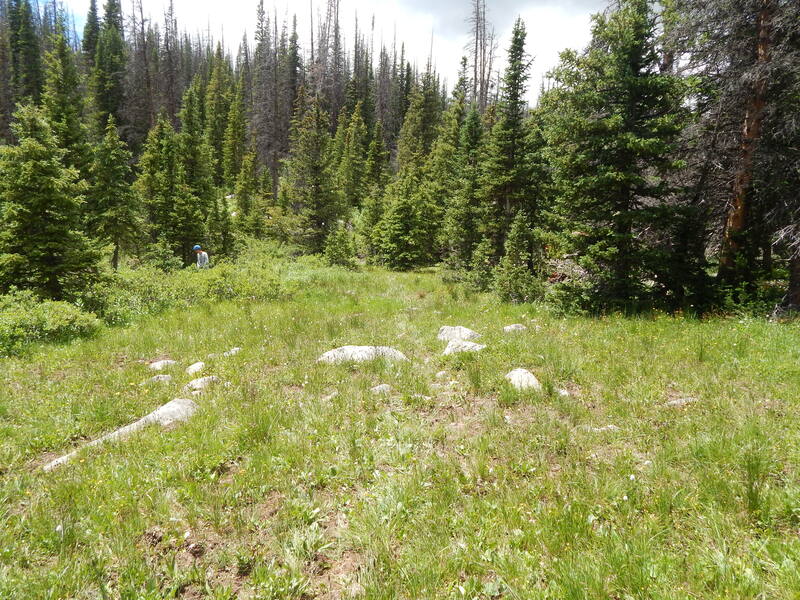 We hiked out to Disappointment Falls and turned around from there and continued to do tread work and make sure there was a defined path at necessary points through the meadow. Life continues to be simple and charmed in the small town of Nederland. 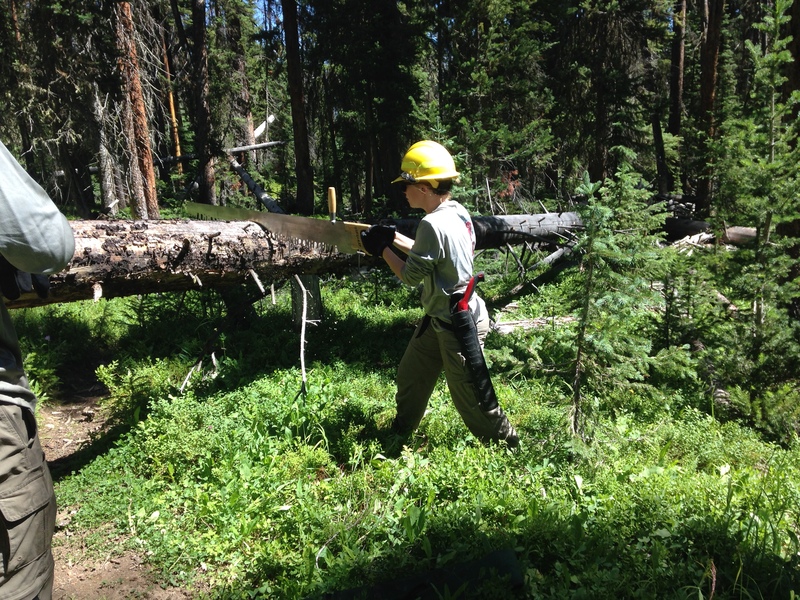 This week we found ourselves clearing a snowshoe trail, which had been completely covered in blown down trees. This took hours of hauling and meticulous teamwork, as we tried to navigate jagged branches. 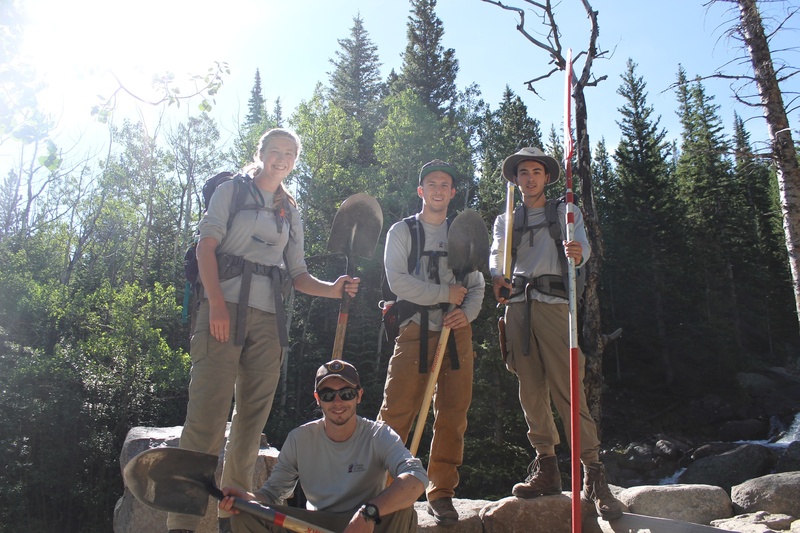 We also had the opportunity to sit in on a USFS district meeting, where we were welcomed as “the trail crew”. 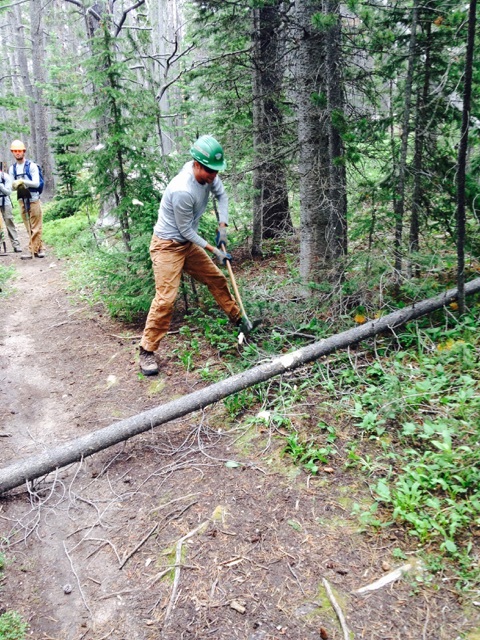 Our other work days were spent installing trail signs on newly created trails. Overall, another excellent week that brought us even closer together as a crew. 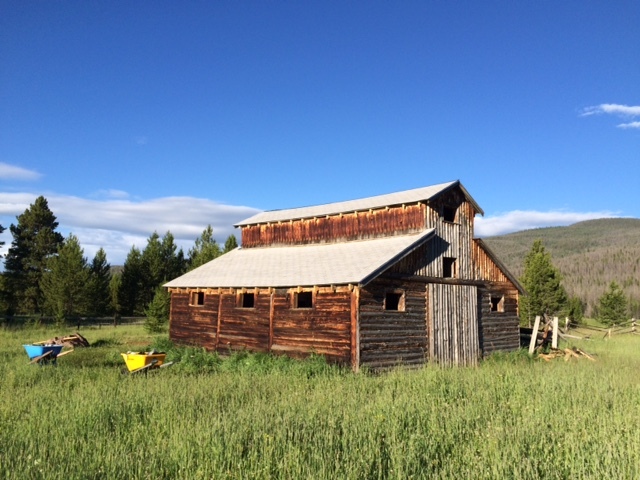 The most exciting part of our week was moving into the USFS bunkhouse. While it was slightly bitter to be leaving our campsite, it is absolutely sweet to have running water and the ability to watch movies and use an oven. We look forward to the closeness these quarters will inevitably bring. 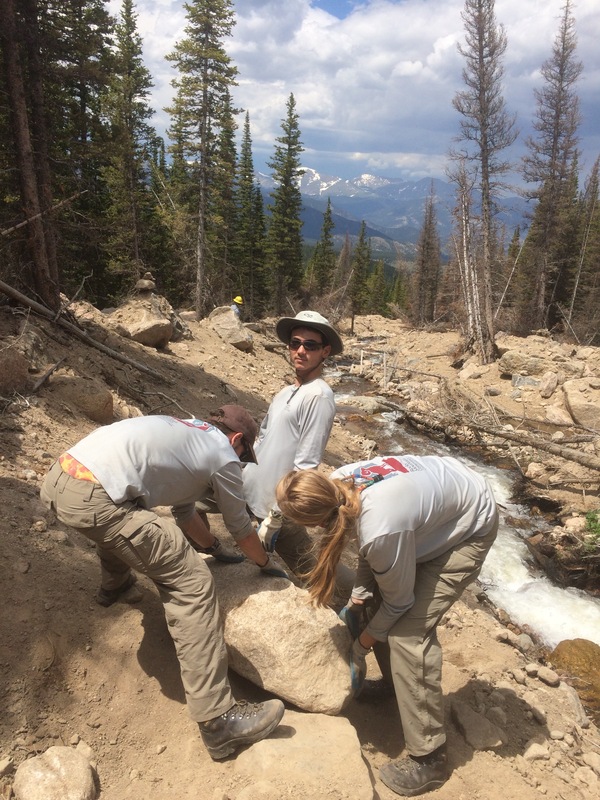 This week the Shadow Mountain Crew worked in the backcountry with eight Forest Service employees from the Wilderness and OHV trail crews to build a turnpike near Columbine Lake in the Indian Peaks Wilderness. 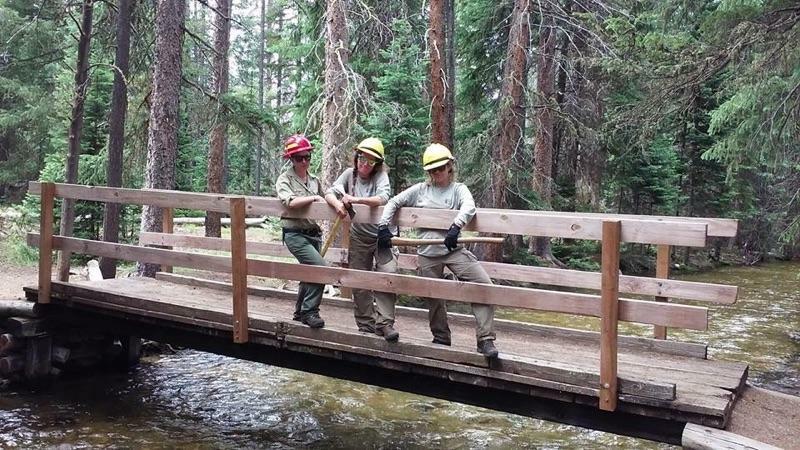 The crew started the week by attending the district meeting for the Sulphur Ranger District. 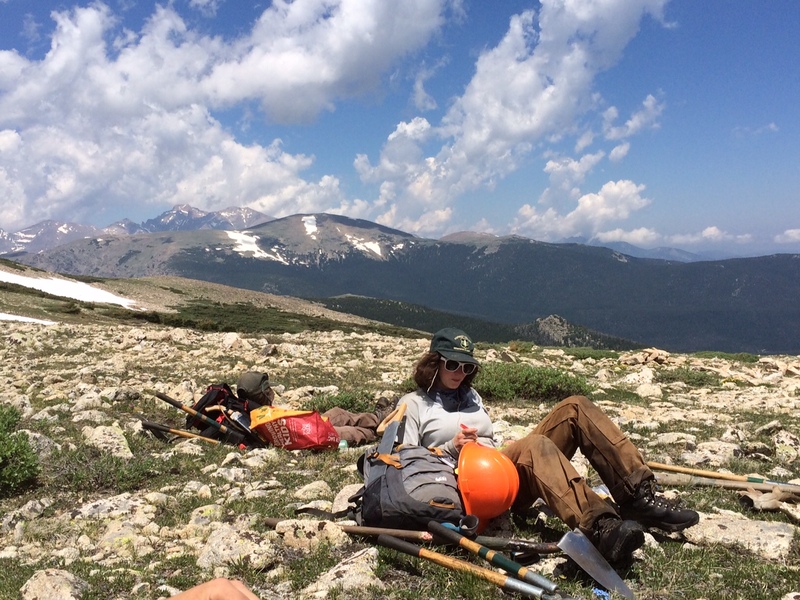 At the meeting they discussed safety in the field and budgeting for the 2016 field season, and the RMC-CC crew even got a shout out for their work on the Knight Ridge Trail! 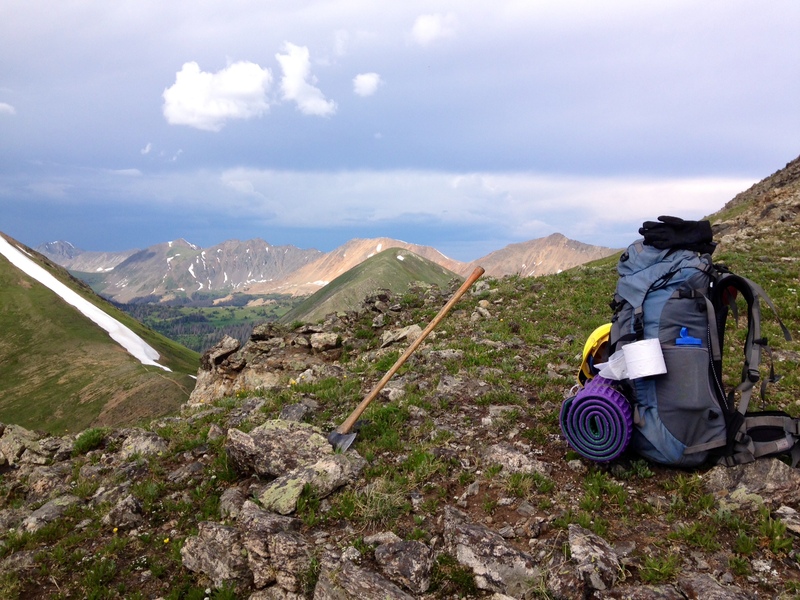 After the meeting the crew left for the Columbine Lake trailhead and spent most of the day packing in camp and tools for the turnpike project. 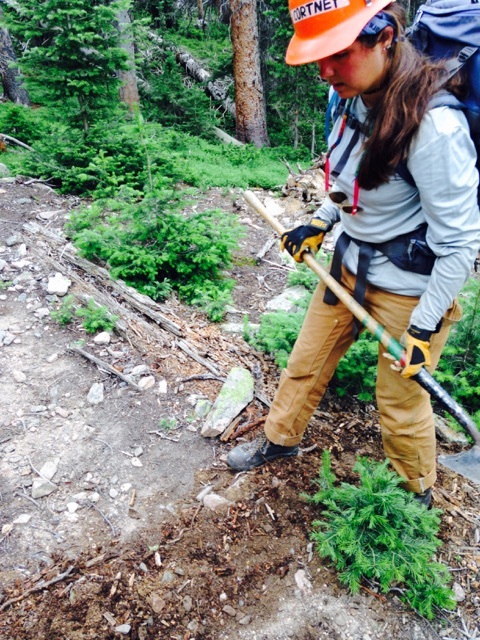 The next morning was spent building new trail for a small reroute and rehabbing the old trail. Once the reroute was completed the crew got to work on the turnpike. The project got underway by falling a few trees with crosscuts and cutting them into sections for the sides of the turnpike. The turnpike was divided into sections in order to allow continued natural flow of water through the meadow where it was built. Once the trees were debarked and put into place with log carriers the crew spent most of the next two days gathering rock to fill the walkway of the turnpike. 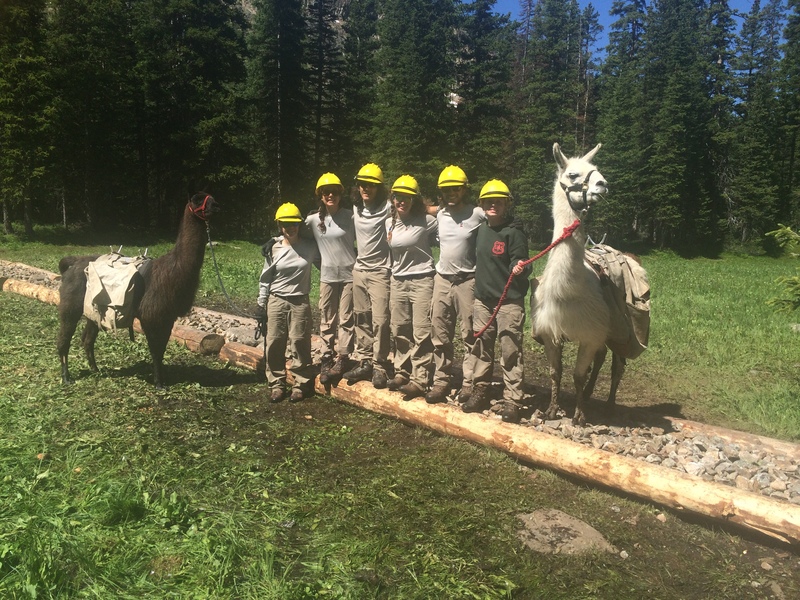 Jed and Henry, the crews llamas, were a great help all week, but they were especially helpful in hauling rock to the turnpike from the rock quarry about 400 yards away. The final turnpike turned out great, and its construction was definitely appreciated by a lot of hikers on this busy trail. It was a hard week of work for the Shadow Crew, but they still found the time and energy to enjoy themselves once the workday was finished. At camp the crew had good times playing whiffle ball and frisbee, and on the last night they took an alternate route to Columbine Lake and hiked up a couloir near their work site. It was cold and rainy at the lake, but it didn’t stop Elias from taking a quick dip! Now its time for a nice long four day weekend to rest up and have some fun in Grand Lake. This is Shadow, until next time! 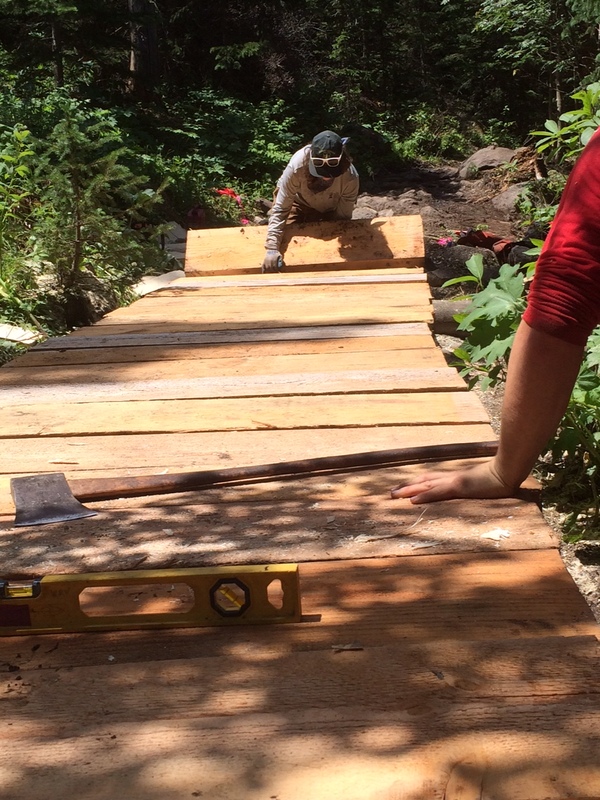 The Boulder Crew finished up the boardwalk that we started last week on the Buchanan Pass Trail. 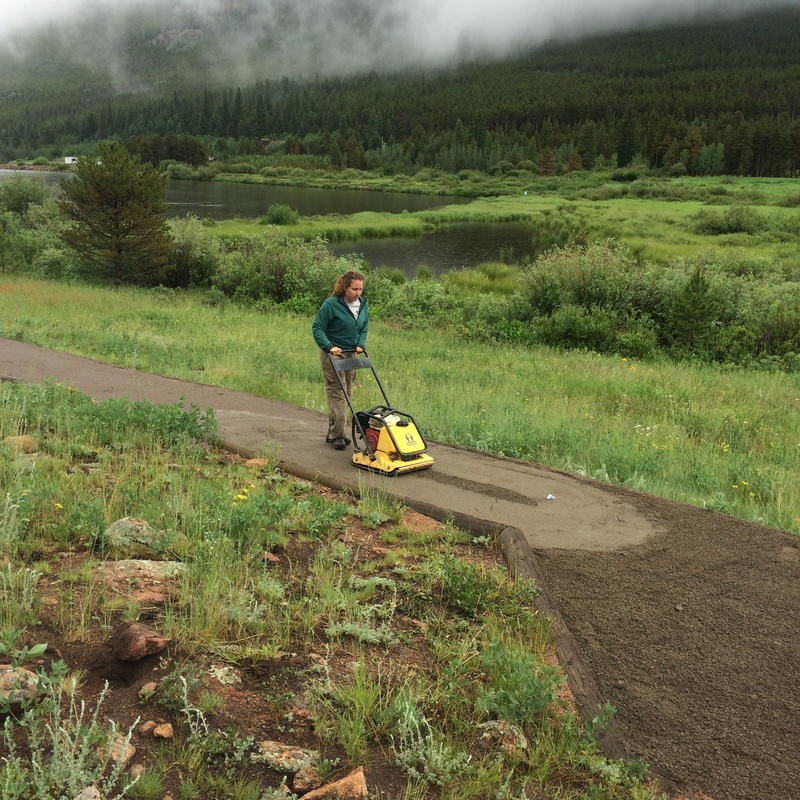 The next day we went to Brainard Lake and created a new trail that helps minimize visitor impact on the wilderness. 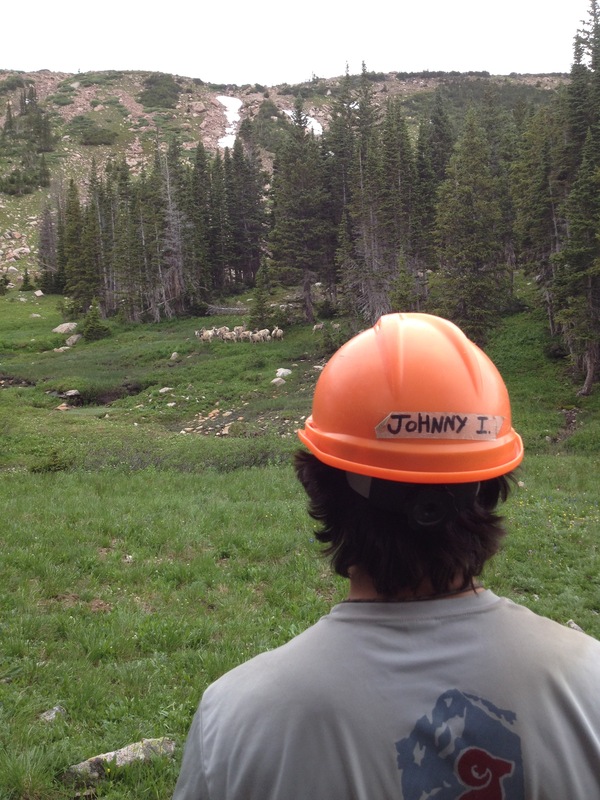 The crew had a lot of fun learning about what went into creating a new trail. 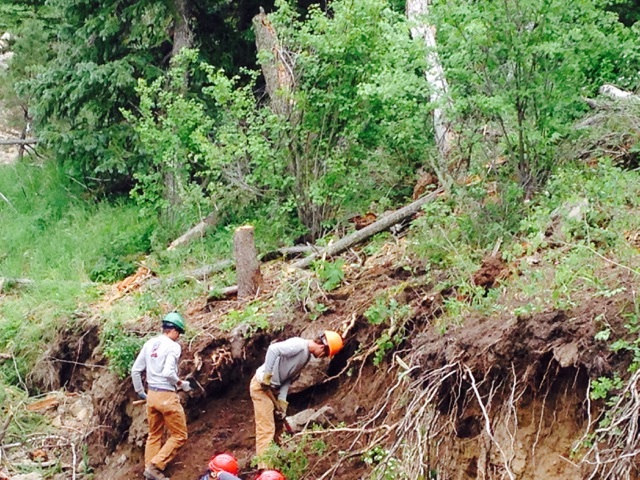 The next two days were spent doing maintenance around Mitchell Lake. A stunning view of the mountains made it feel like we weren’t even at work. On our days off the crew had a blast hiking James Peak, the 13,300 foot mountain that we see everyday from our campsite. We spent the Fourth of July in Nederland, a charming mountain town. Watching fireworks over a lake and mountains was an amazing way to celebrate together. 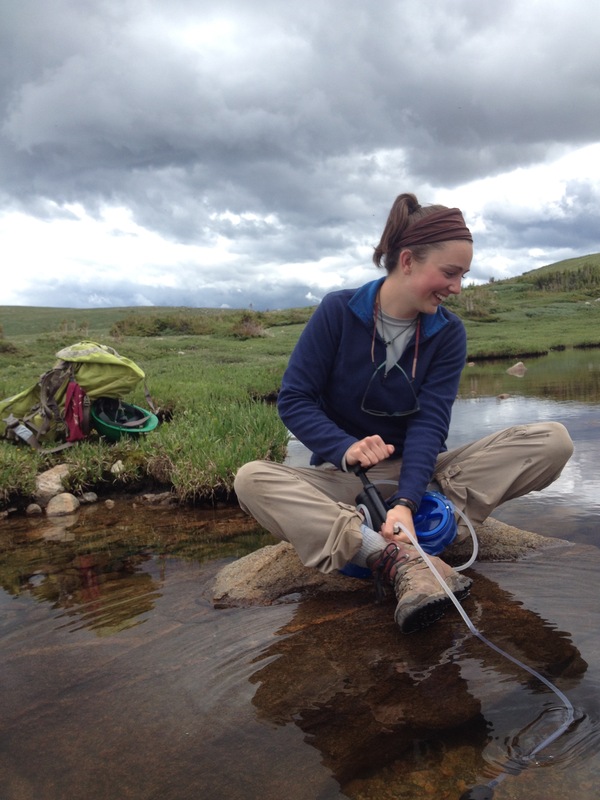 Everyone is really psyched for mid-week where we’ll be back in Rocky Mountain National Park! 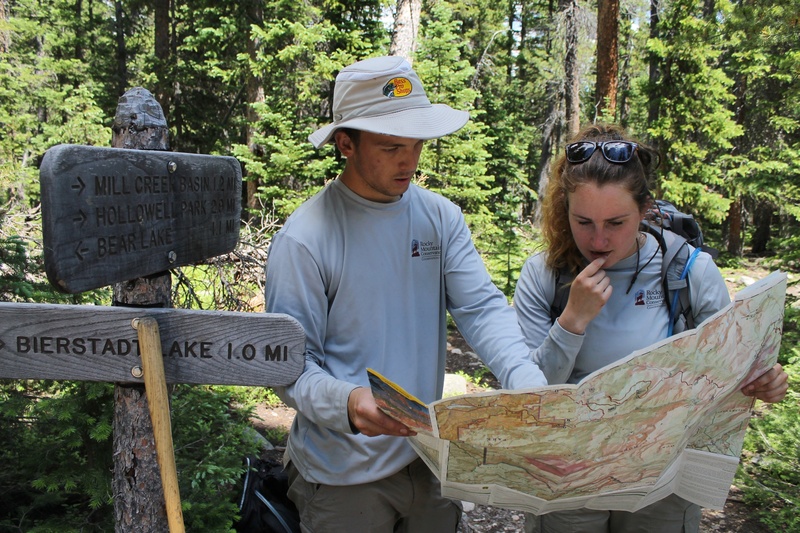 This past week, Jordan and Rachel, accompanied by a member of the U.S. Forest Service, started a four day back country excursion at Junco Trailhead and ventured up to Columbine Lake to scout out a future project. 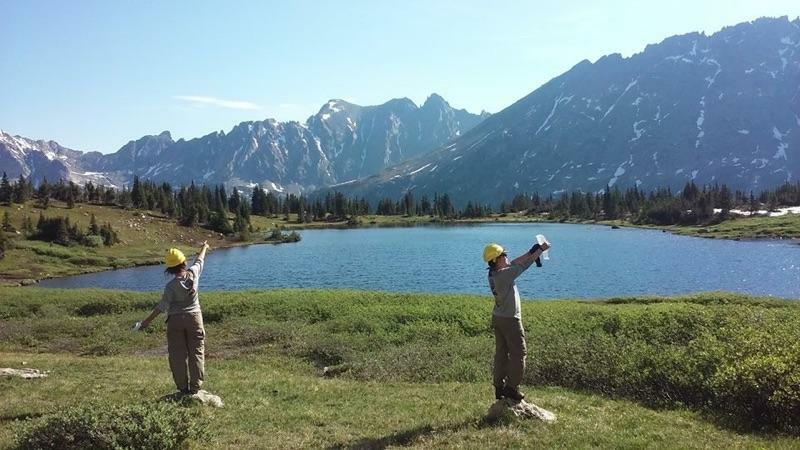 From there, they ascended Caribou Pass to complete an 18.8 mile loop down to Caribou Lake and followed Arapaho Creek out to the Monarch Lake Trailhead. 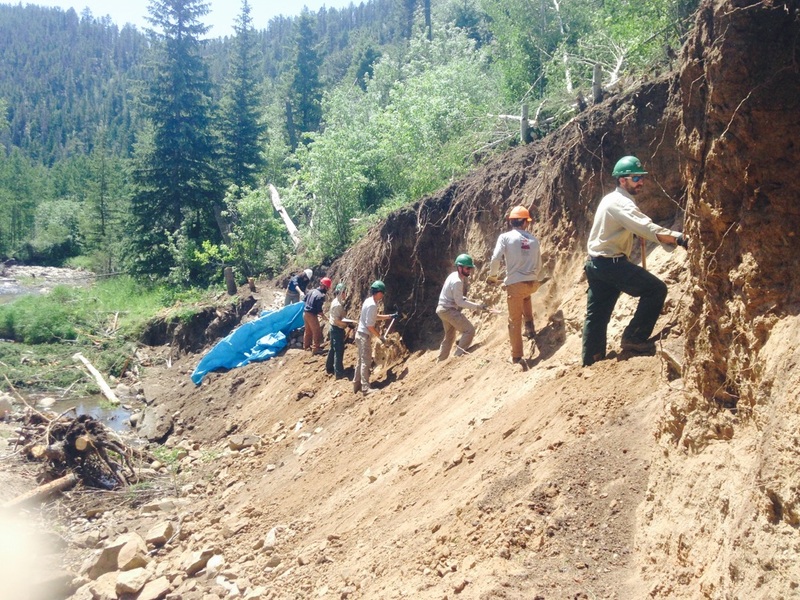 Over the course of the trek, the group dug approximately 45 drains and cross cut 50 trees. 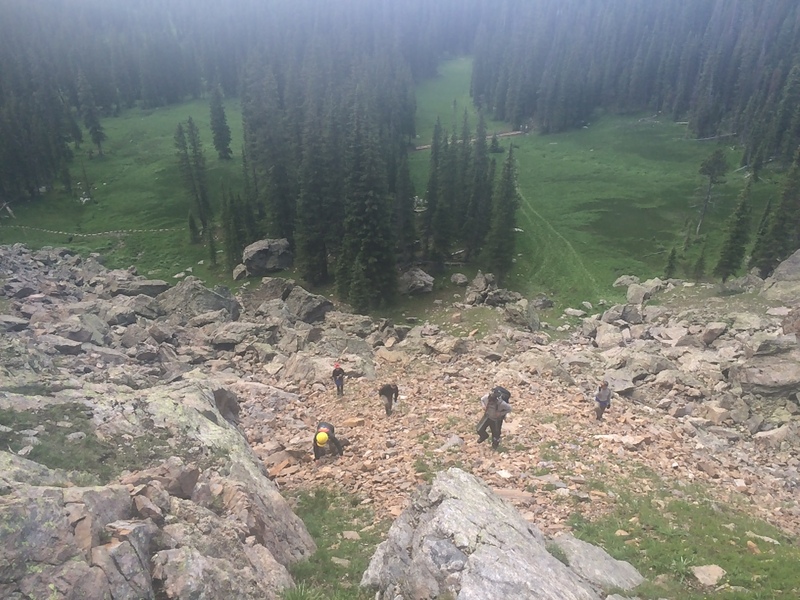 They overcame bugs, snow, and rain to patrol the Indian Peaks Wilderness during the busy Fourth of July weekend. 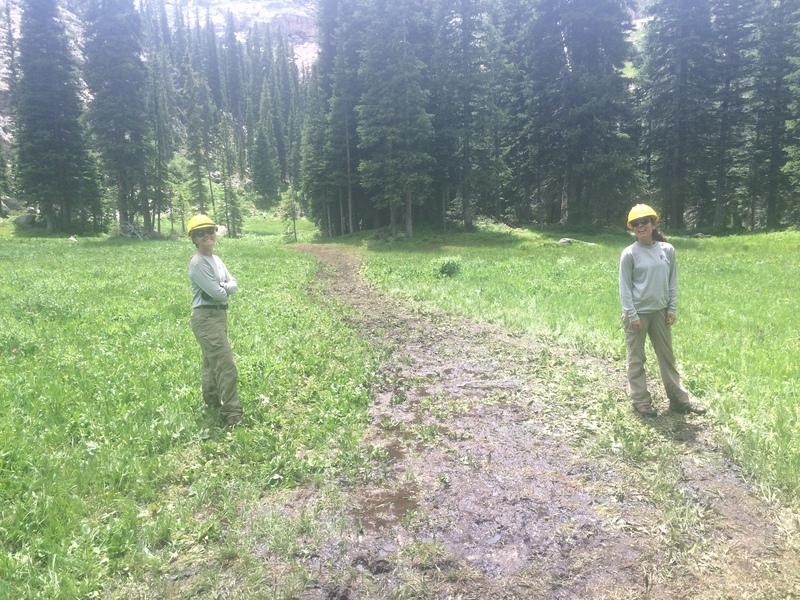 On Fourth of July weekend, MegEllen and Elias, led by Corey Kohen of the Sulphur Ranger District non motorized trail crew, set out on their patrol through the Never Summer Wilderness. 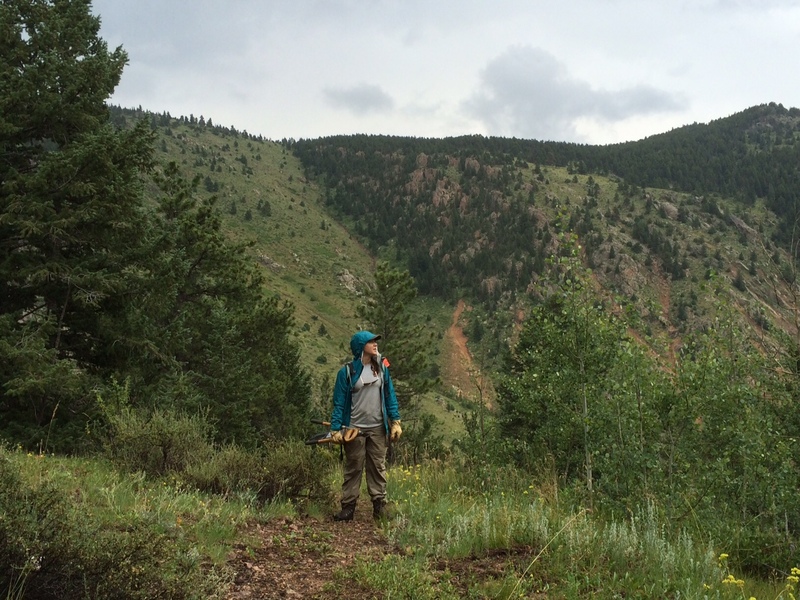 The patrol began at the Bowen trailhead and looped around to the Baker trailhead. The Bowen/Baker loop is high priority for the SRD because it is the most popular portion of trail in the Never Summer Wilderness. For this reason, the primary objective of the patrol was originally making public contacts over the holiday weekend. 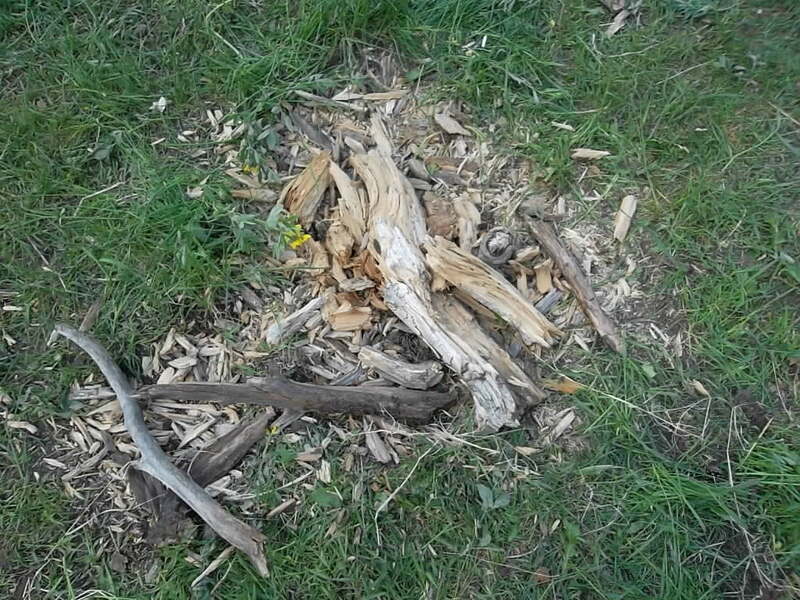 It is extremely important to educate the public about their impacts on the land, for example; camping near the lake was prohibited and our duty was to scatter tempting fire pits. The secondary objective, clearing trees, turned out to be underestimated. 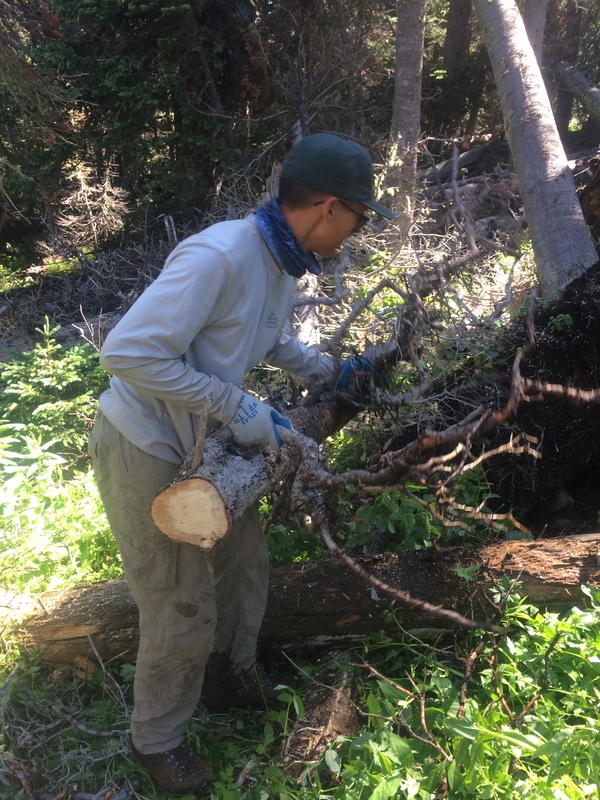 MegEllen, Elias and Corey cleared a total of 99 trees from the trail, far more than were originally expected. Public contacts were made as well, but ended up being a lesser priority. The patrol was a success; the entire trail of 19 miles was clear of fallen trees. Apart from the satisfaction that a fulfilling week of work brings, something must be said for the beauty of the Never Summer Range. By the end of the patrol the trail crew had visited three lakes, each more beautiful than the last. Our final night was spent just below Parika Lake, a beautiful oasis above the tree line. 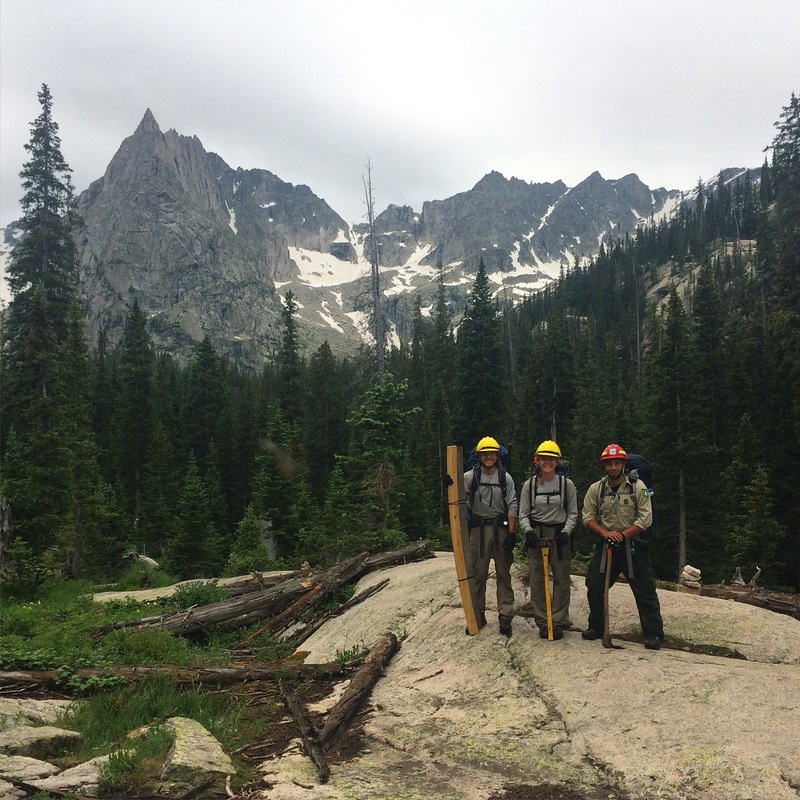 This week, Amy and Blake accompanied Forest Protection Officer Andy Borek on a backcountry patrol in the Indian Peaks Wilderness. 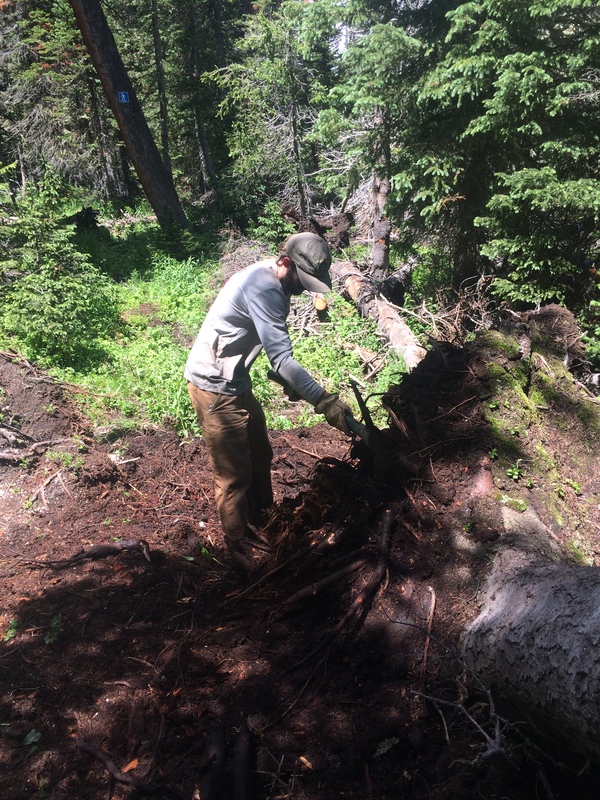 Starting out at the Monarch Lake trailhead, they headed up the Cascade Creek Trail, clearing downed trees and digging drainages along the way. 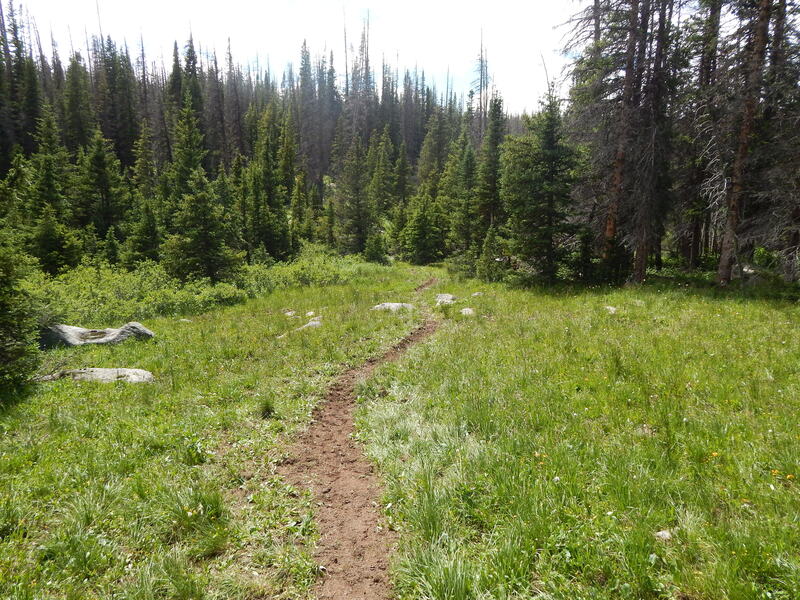 This trail is one of the most popular in the Sulphur Ranger District, so they came across many hikers enjoying a beautiful Fourth of July weekend! 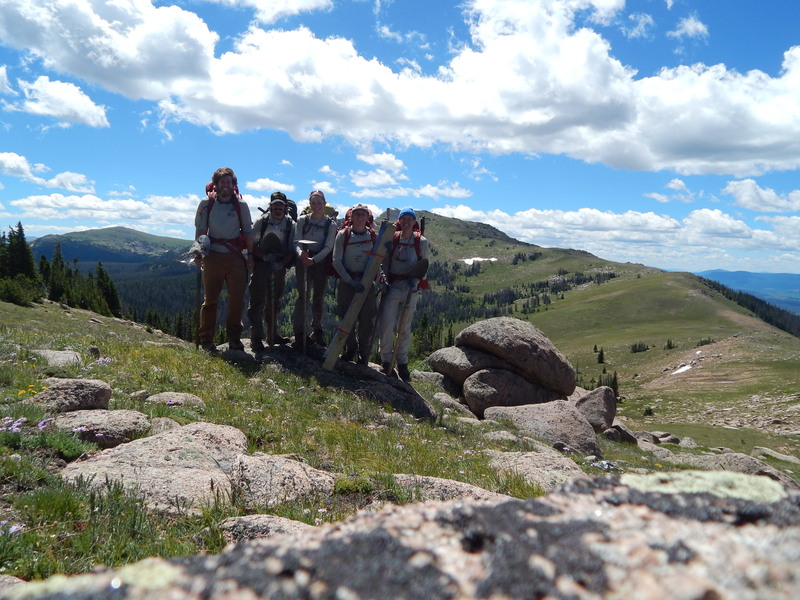 The purpose of this trip was not only to clear trails, but also to make contact with the public and enforce wilderness policy. 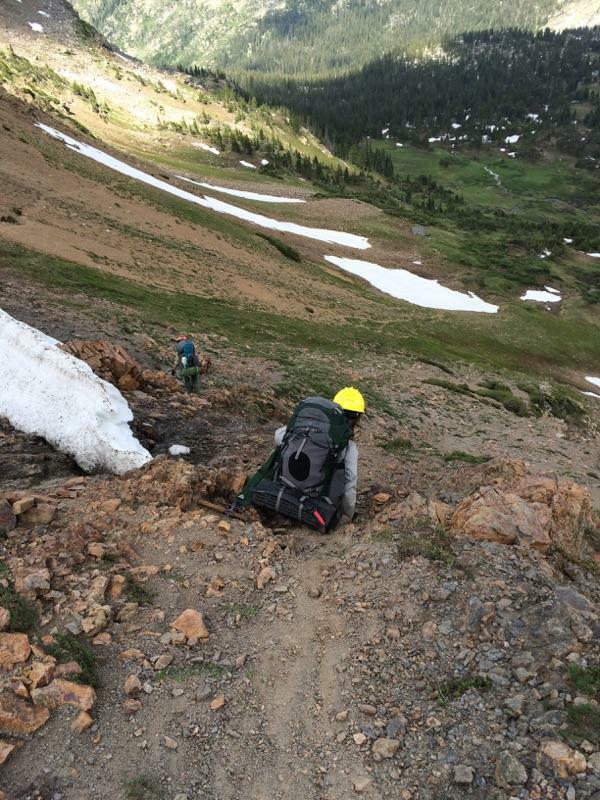 After spending the first night about a mile up the Buchanan Pass Trail, the crew headed northeast to check out a recent avalanche zone near the junction with the Gourd Lake Trail. Then, they turned back towards the Cascade Creek Trail and cleared trail up towards Crater Lake. 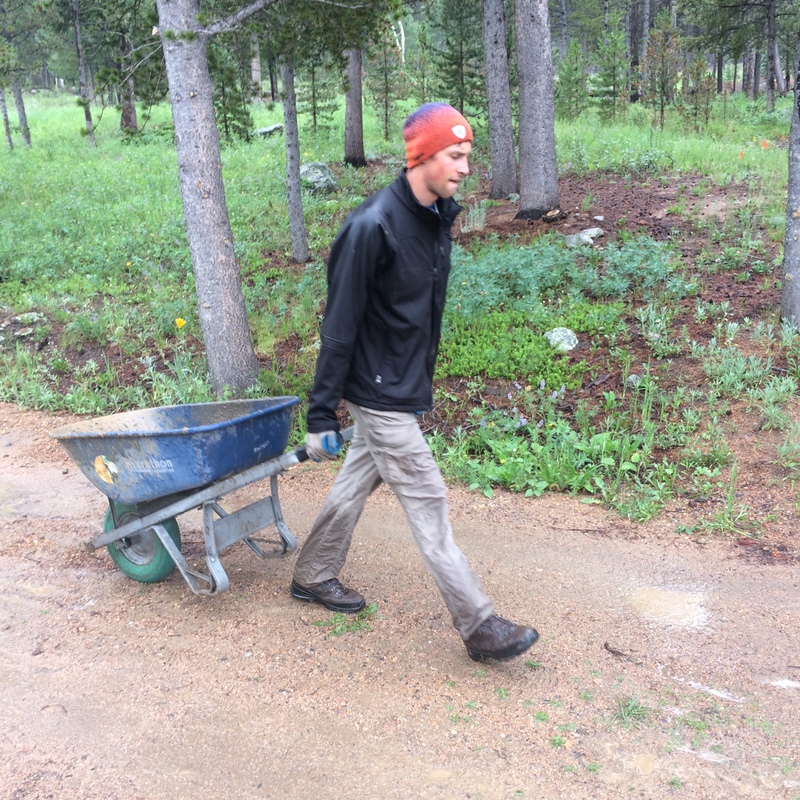 On the way, they stopped at Cascade Falls and made multiple public contacts, checking backcountry camping permits and making sure hikers were keeping their dogs on leashes. They then spent the night at Crater Lake, which is one of the most beautiful areas to camp in the district, which also makes it one of the most heavily trafficked backcountry sites. 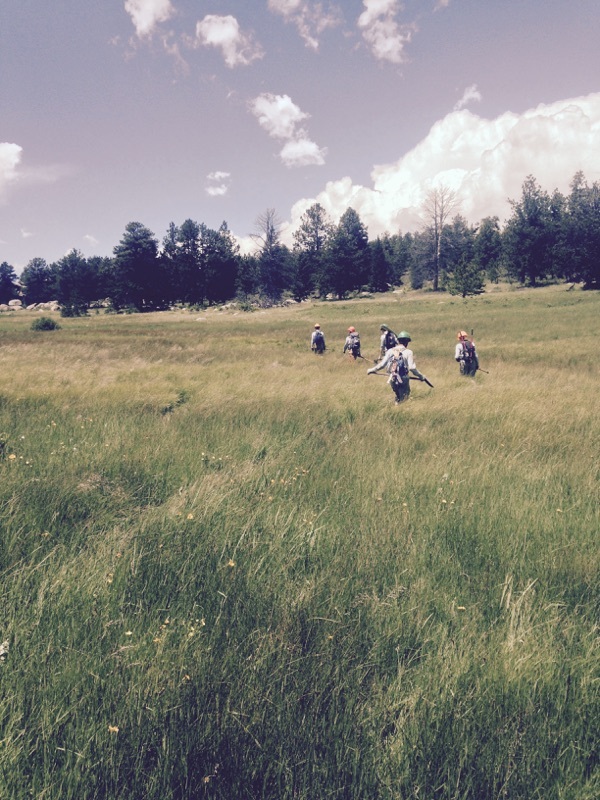 The next day, the crew spent the Fourth of July on a day trip to clear trail towards Pawnee Lake on the Pawnee Pass Trail. 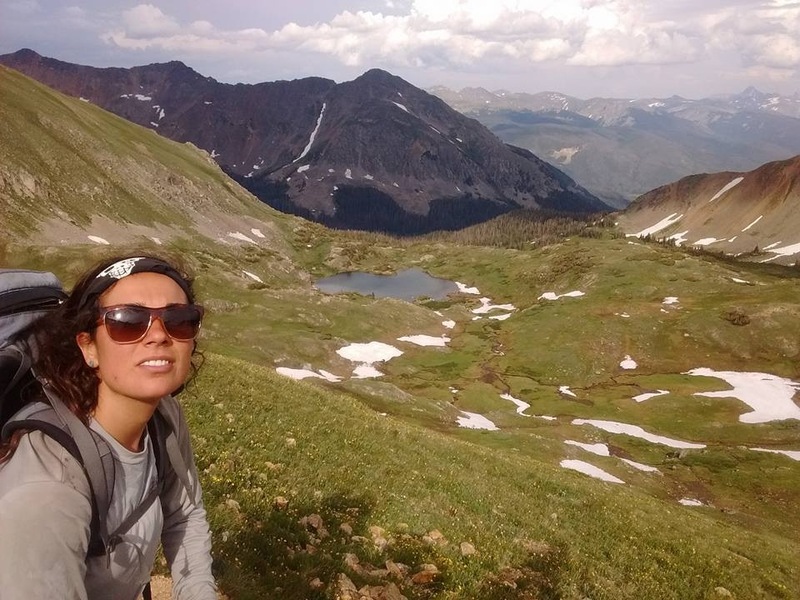 This area attracts hikers from both the east and west sides of the divide. 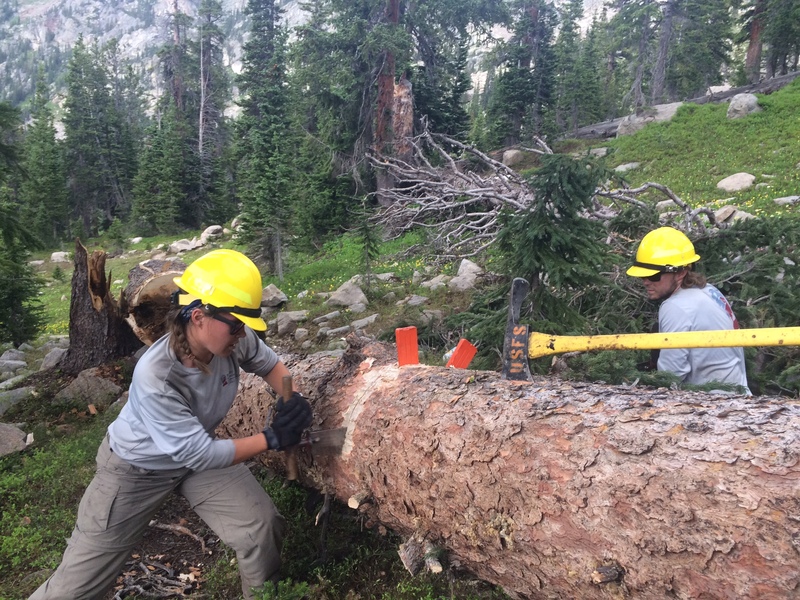 Just past the lake, they encountered a 28 inch tree across the trail, which required three cuts and took the rest of the afternoon to clear. 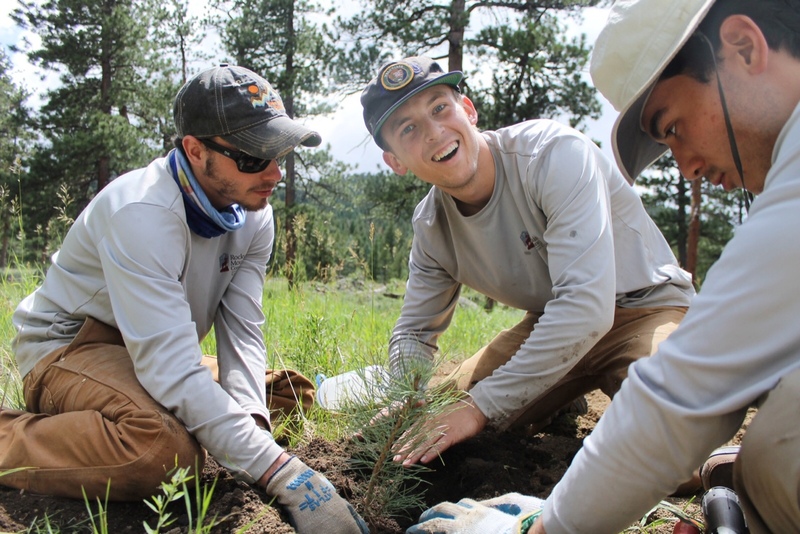 The crew also had to ask a group of campers to relocate their site away from a riparian zone along the shore of Pawnee Lake. A large thunderstorm made for a damp hike back to camp at Crater Lake, where they made it back just in time for it to start hailing. 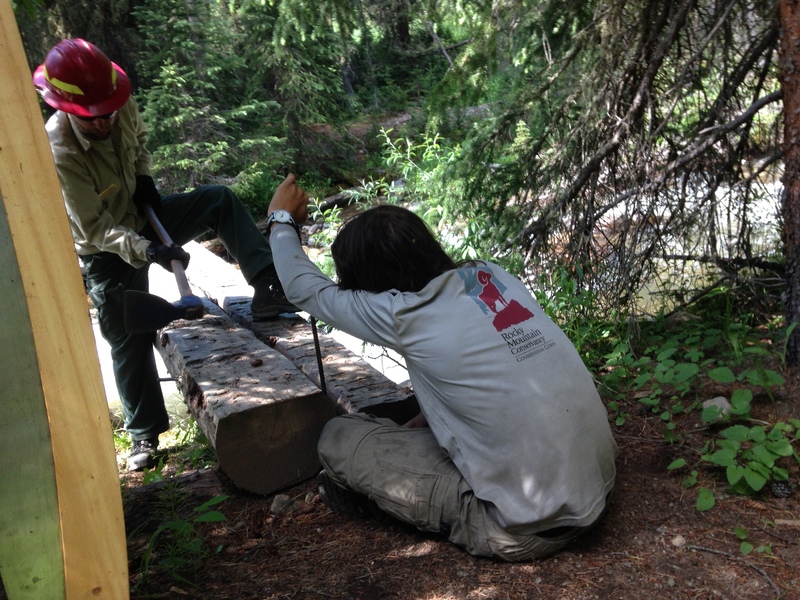 On the last day, Andy, Blake, and Amy packed up camp and hiked out via the Cascade Creek Trail, disassembling illegal campfire rings along the way in order to mitigate damage along the heavily used trail. 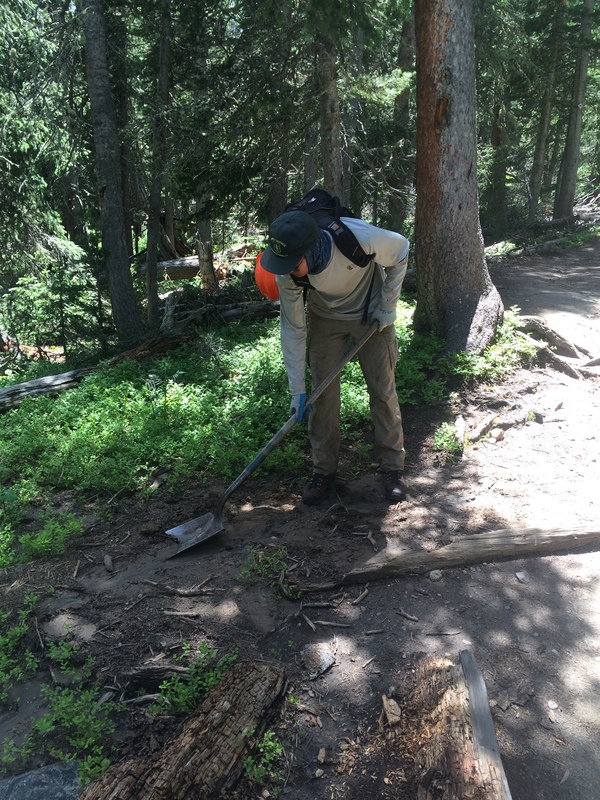 They also completed some regular trail maintenance on the way down. 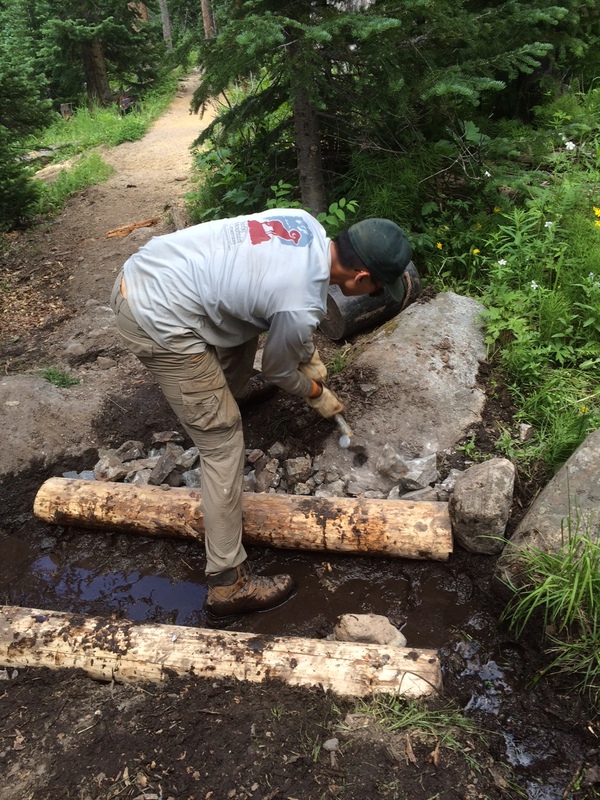 This Fourth of July backcountry hitch was successful in improving sections of multiple trails in the Cascade Creek area and encouraging the public to recreate responsibly in the Indian Peaks Wilderness!